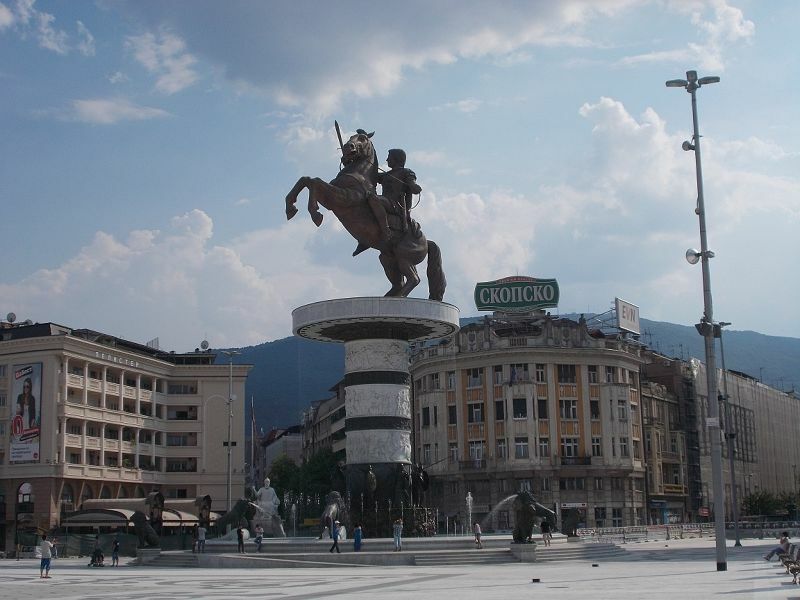 Macedonia - Trips to the Balkans. Land of the Giant Statue. 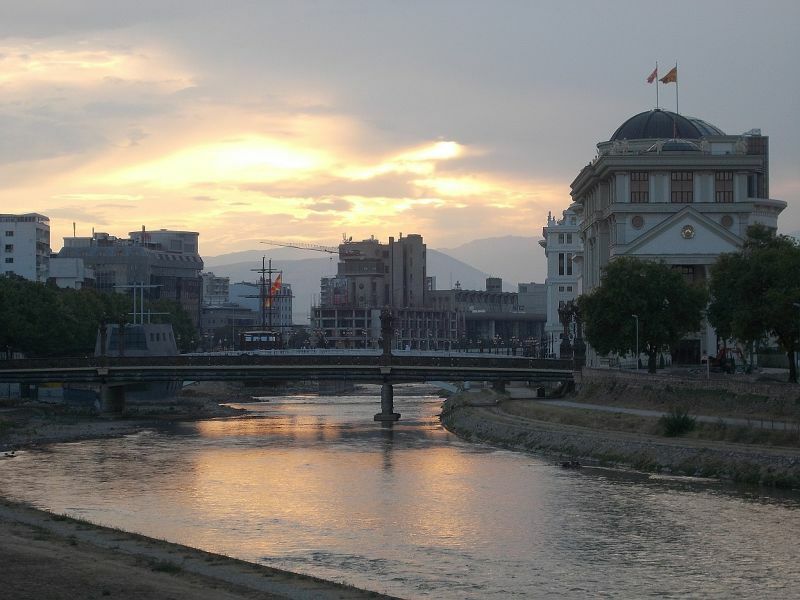 Sunset over the River Vardar. 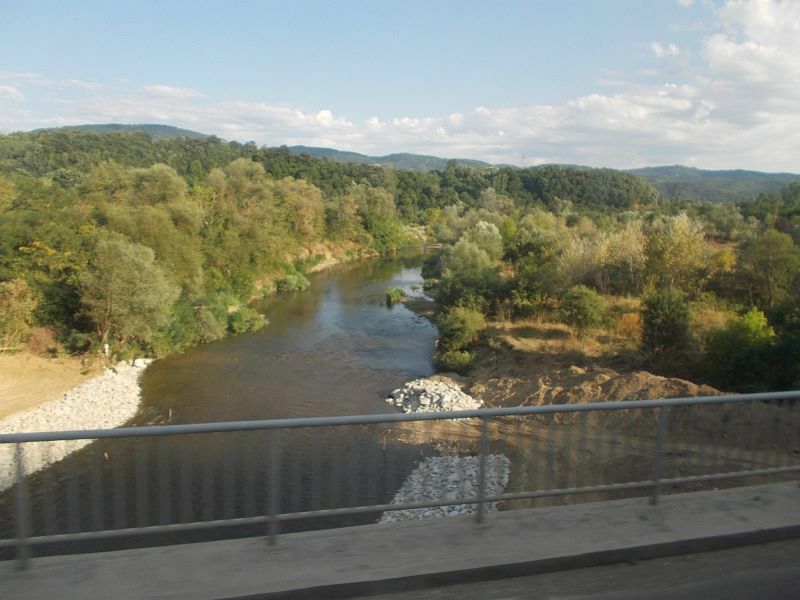 This was really our first visit to Macedonia though we passed through it twice in 1988 on the train. 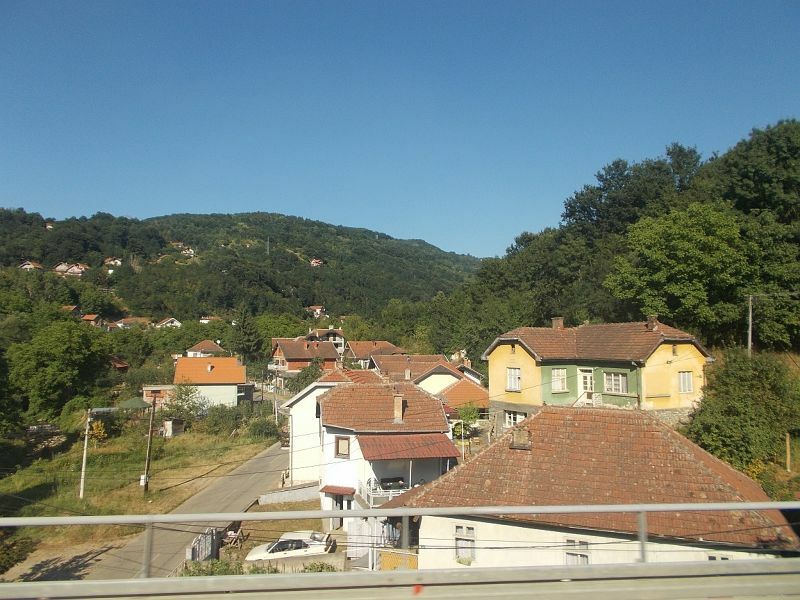 On our train journeys between Thessaloniki and Belgrade, Skopje is the only station I clearly remember. The reason for this is that when we stopped there, bands of ragged children ran up to the train pleading for money. People threw handfuls of coins from the train and the children frantically battled to gather them up. I was glad we were not getting off the train; Skopje looked very poor and a bit scary. The reality of Skope now is very different from my first impressions. 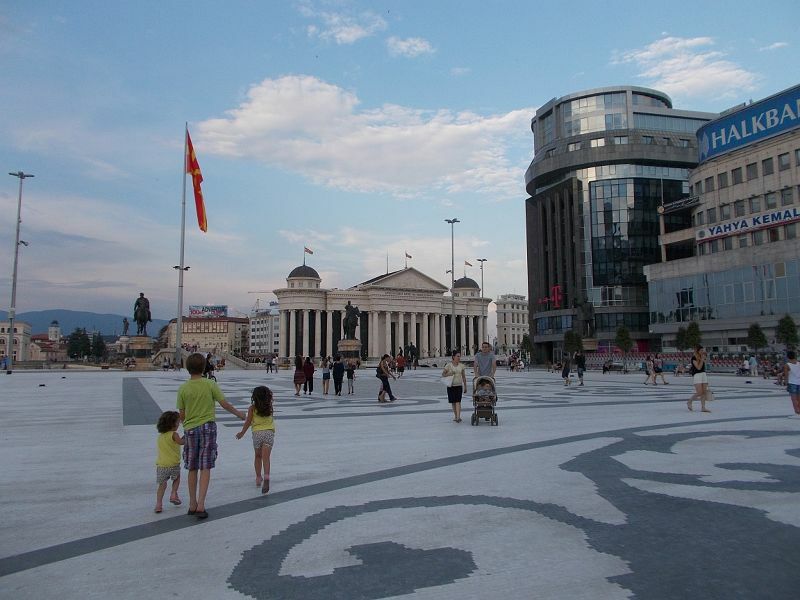 Skopje is the capital city of Macedonia. 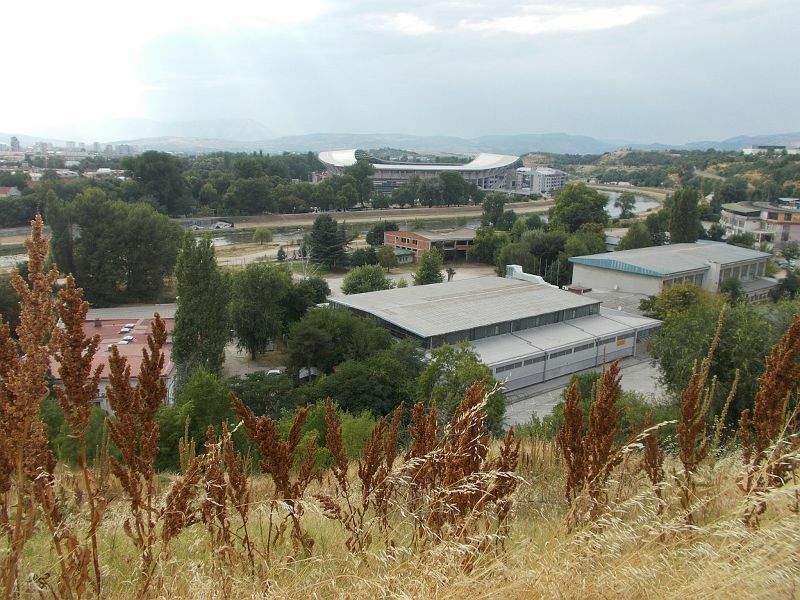 It is situated on the River Vardar. 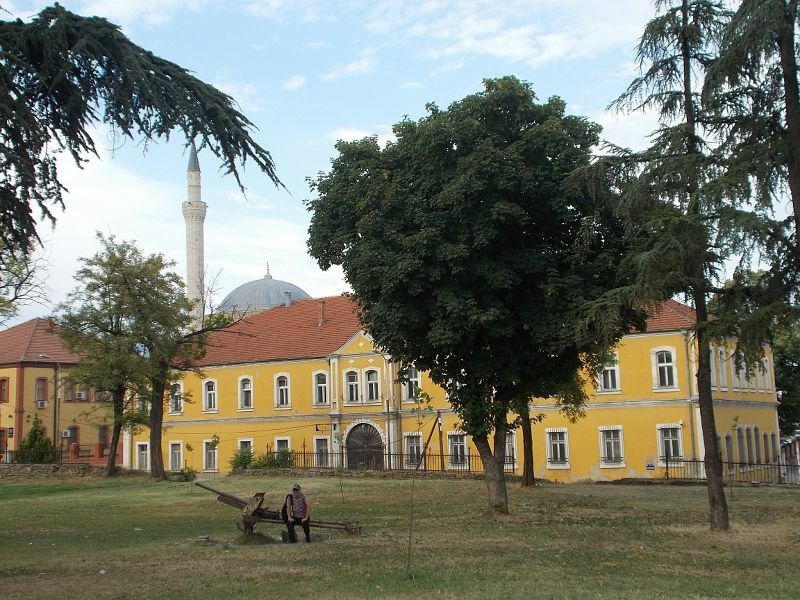 The most beautiful part of the city in my opinion was the old Turkish area. I also liked the old fortress. The other side of the river around stone bridge and Macedonia Square was very odd. 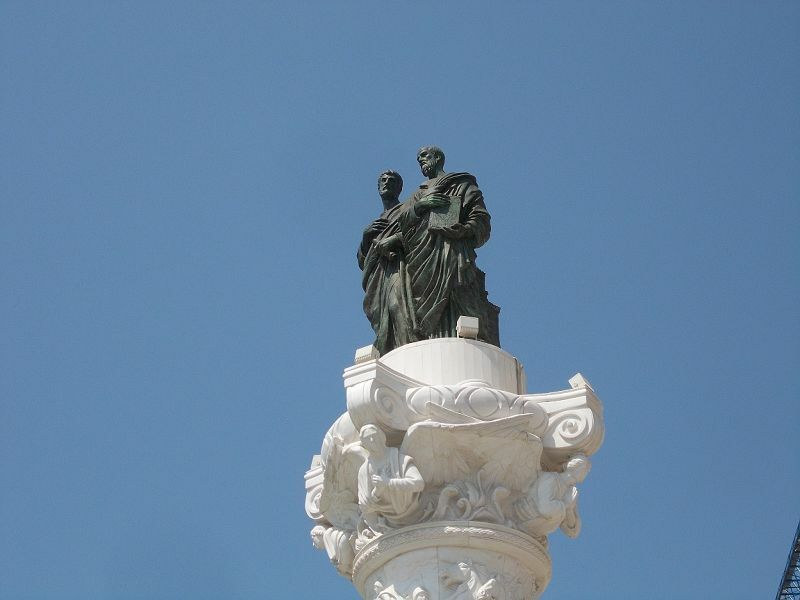 The government has decided to revitalize it by building lots of huge, new public buildings, enormous statues and elaborate fountains. It all looks very surreal like you are standing on a film set for a Batman movie or something. 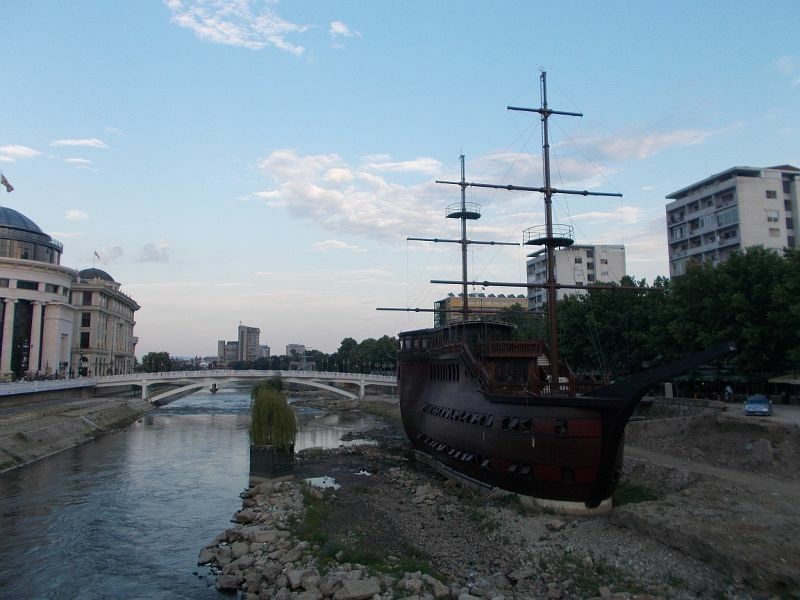 The project called Skopje 2014 should already be finished but is still going on, turning many parts of the city into building sites. It has also gone seriously over-budget. 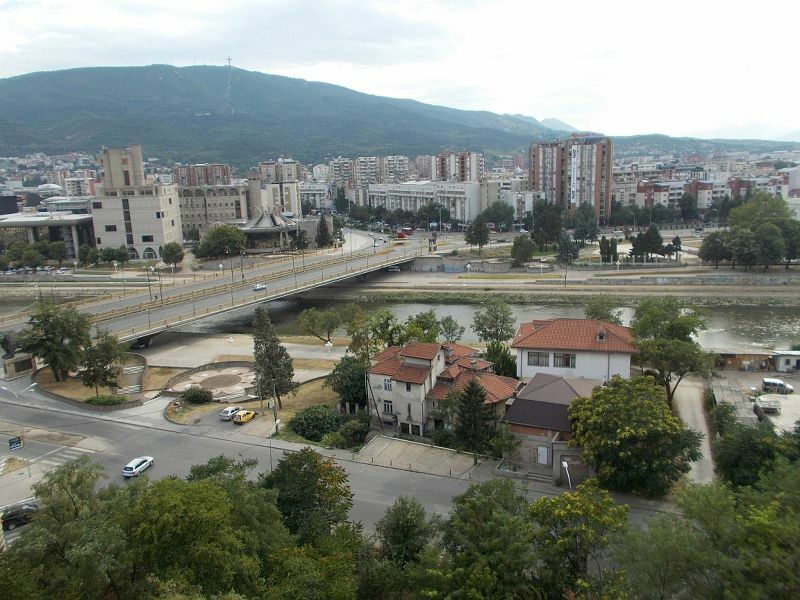 On the plus side for Skopje the development has attracted many visitors and the city could certainly not be described as boring. 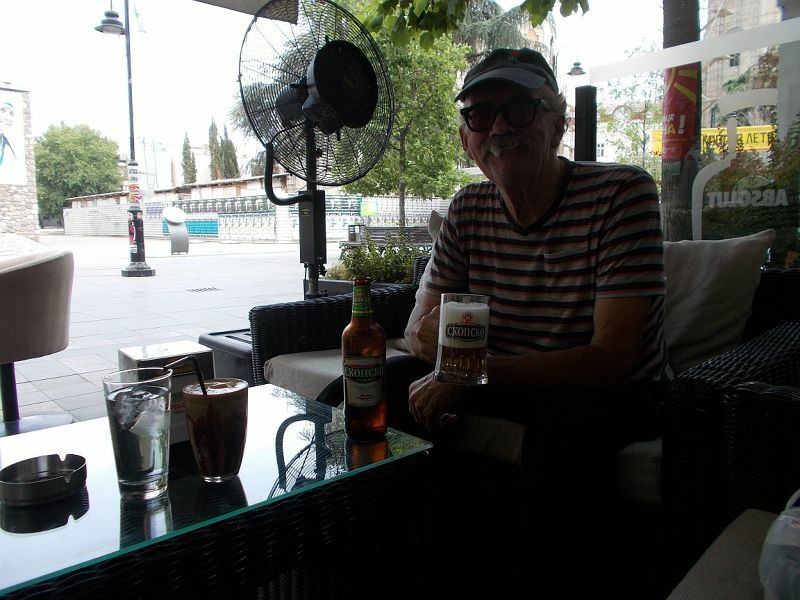 Another big plus for Skopje is that it has lots and lots of open-air restaurants, cafes and bars where you can sit in the shade sipping an ice cold Skopsko beer. 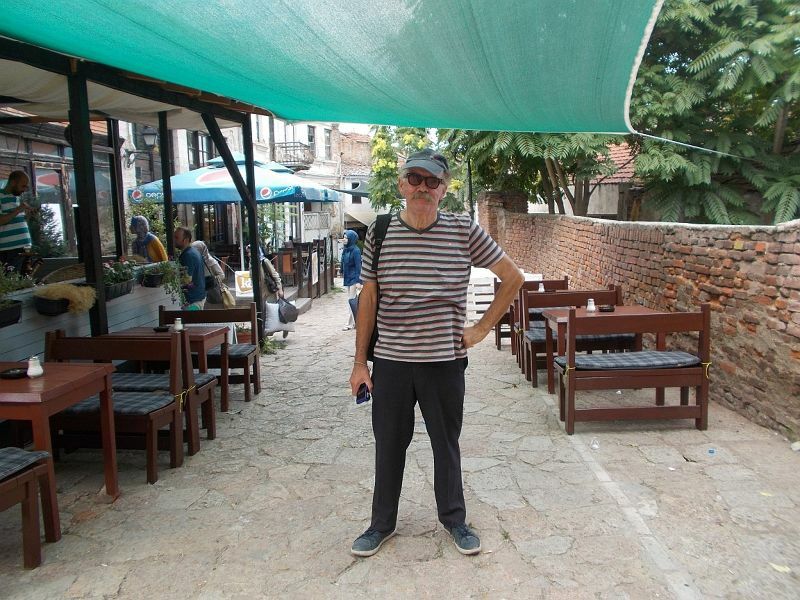 We did not have a particularly good time in Skopje. This was nothing to do with the city itself. 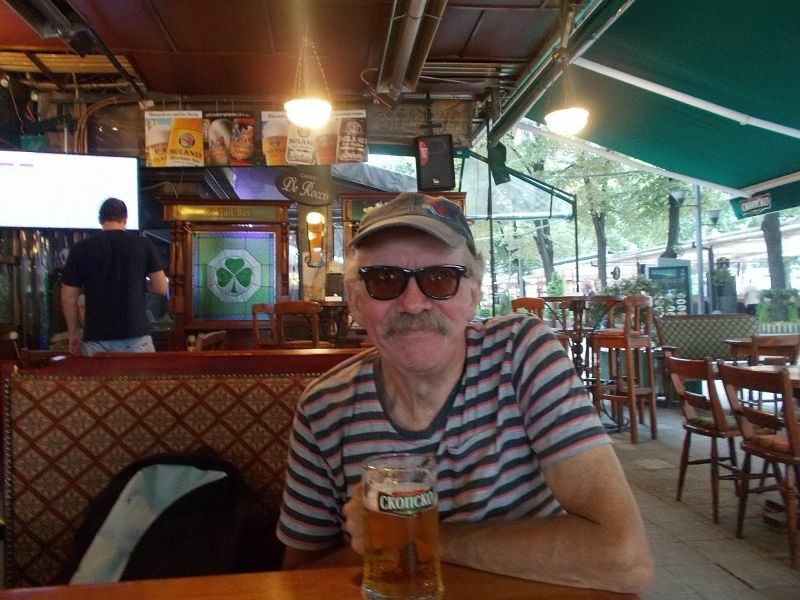 My husband started to feel ill on the bus journey down from Nis - five hours, no toilet on the bus, no comfort stops, big delays at the border. When we arrived, I wanted to eat and he wanted to go to bed. 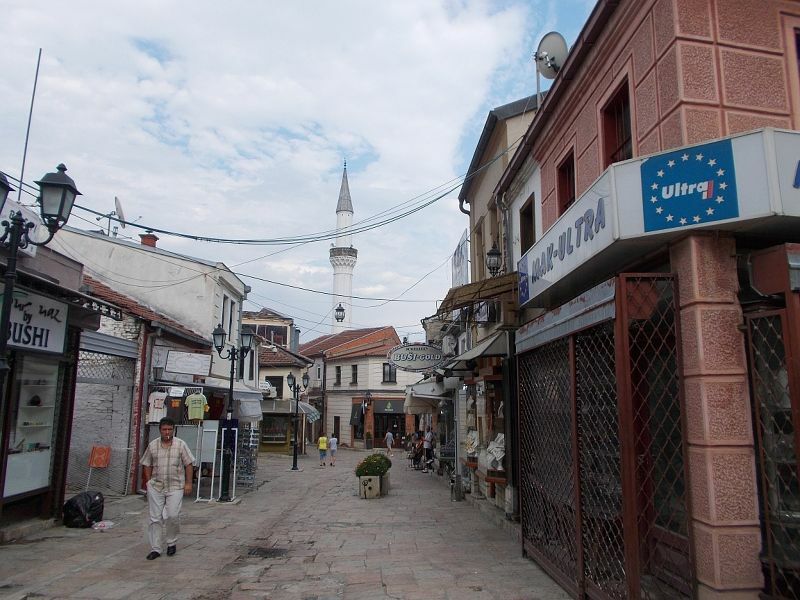 He proceeded to having terrible stomach problems for our whole stay and ended up not being able to wander far away from a toilet at any point, He could also scarcely eat or drink and was up all night, every night ill. We got medicine for him from the Zengin Pharmacy. This worked but it began to kick in just as we were leaving the country, so our whole short three night stay here was blighted by illness. Oh well, such is life, the important thing is he is now recovered. 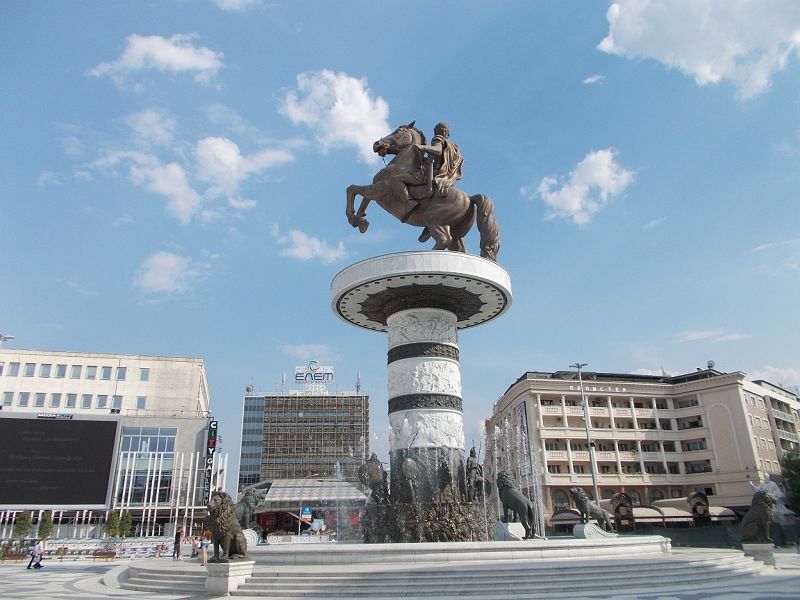 Macedonia will just have to be re-visited in more pleasant circumstances. Aloha Apartmants: A Stay Fraught with Problems. I did not enjoy staying here, but this is not entirely due to the place. A lot of it had to do with the fact my husband was so ill for our whole stay. The people here were pleasant enough. 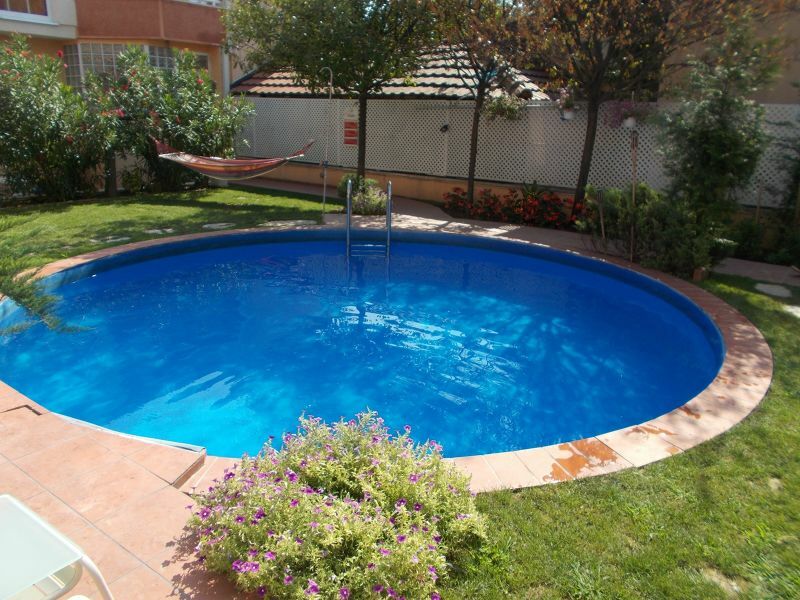 The garden and little pool were nice. The room was a bit run down. Fixtures and fittings needed repairs. 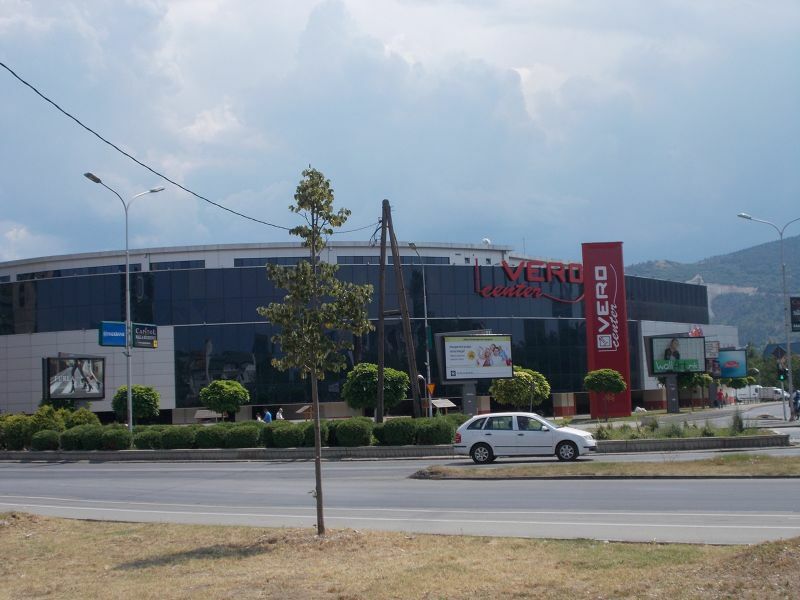 The location was hard to find, but once you had found it, it was convenient for the Vero Supermarket, the city centre, the bus and train stations. Address: Vardarska 27, 1000. Aloha Apartmants: A Stay Fraught with Problems.Things to Do. This area's name comes from the Turkish word for market. 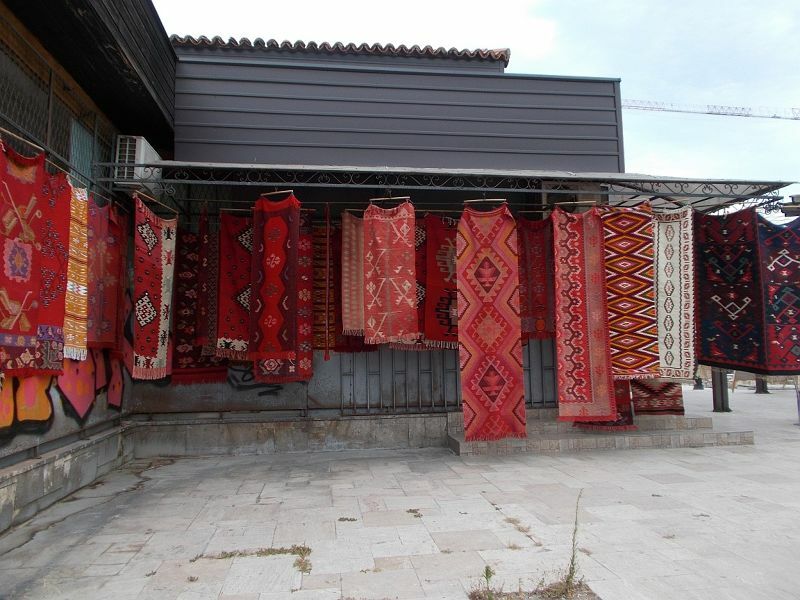 It is the old Turkish part of town and, in my opinion, the most beautiful part. 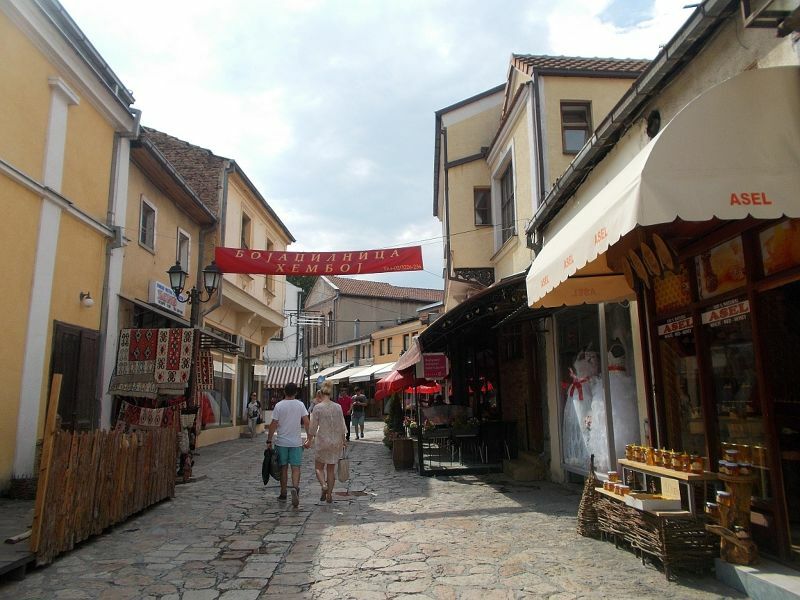 The narrow winding streets here are filled with little shops and cafes. 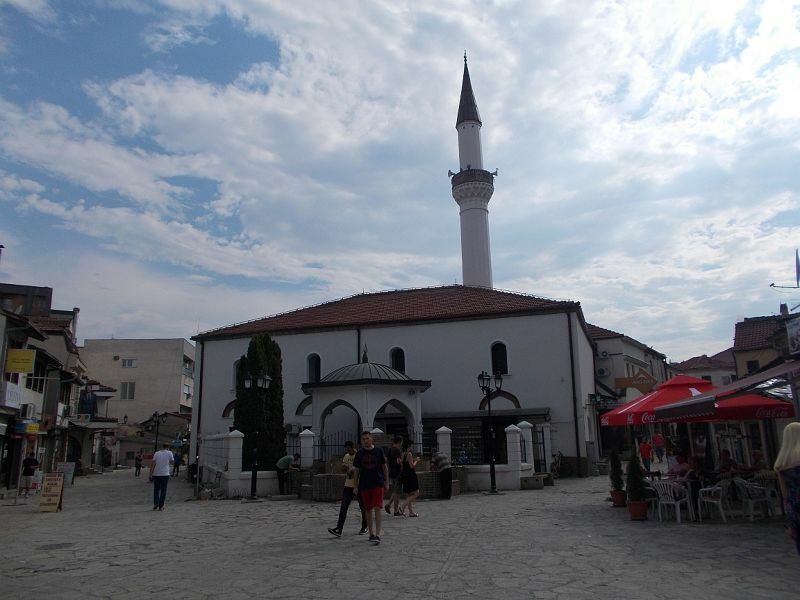 There are many mosques and several museums. I did not spend my time here looking for particular sites but rather just wandering aimlessly trying to take it all in. 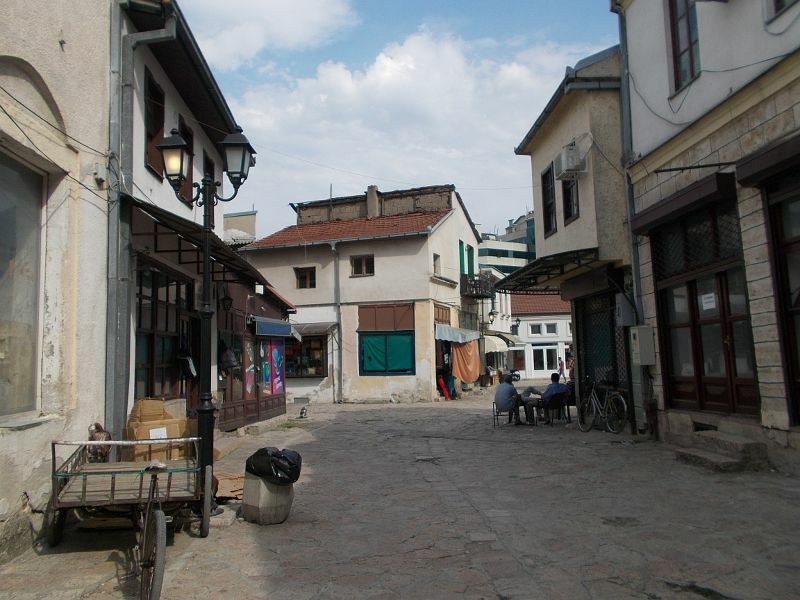 This area has also been revitalized just like the areas on the other side of the Vardar River but the old buildings have been retained and the area is extremely pleasant for a stroll and has a lot of character. 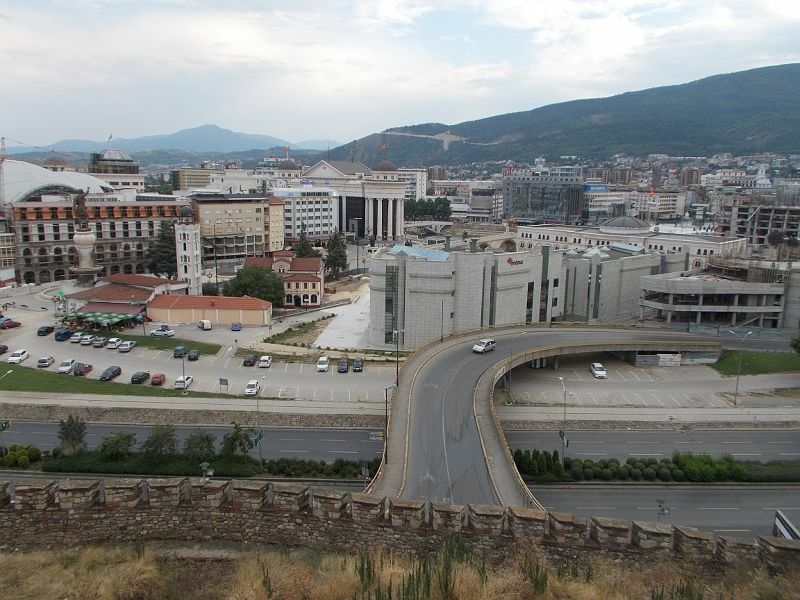 I loved this area of Skopje. With Peter being so sick during our stay we only came to this area once. I would like to return and re-explore it some day. Directions: Across The stone bridge from the main square. This lovely church is located in the old Turkish quarter of the city. 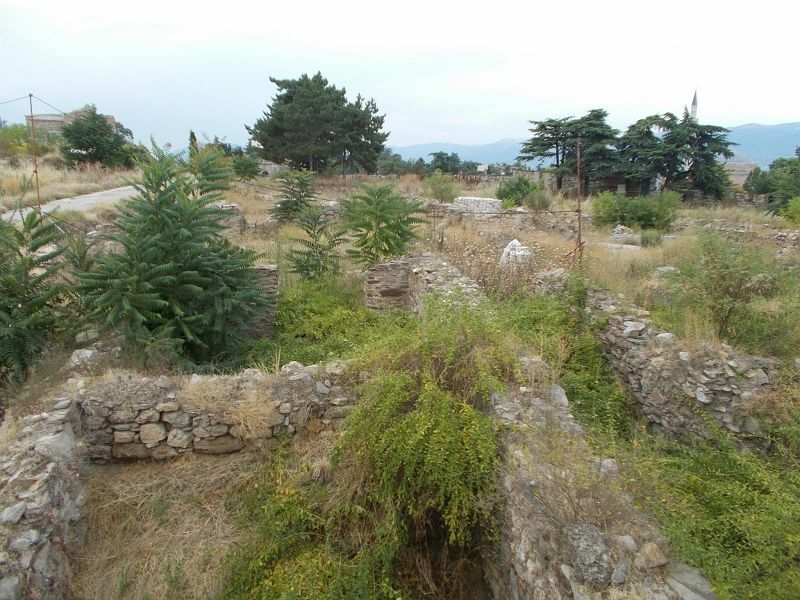 It is partially underground as a church was not permitted to be higher than a mosque during Ottoman rule. 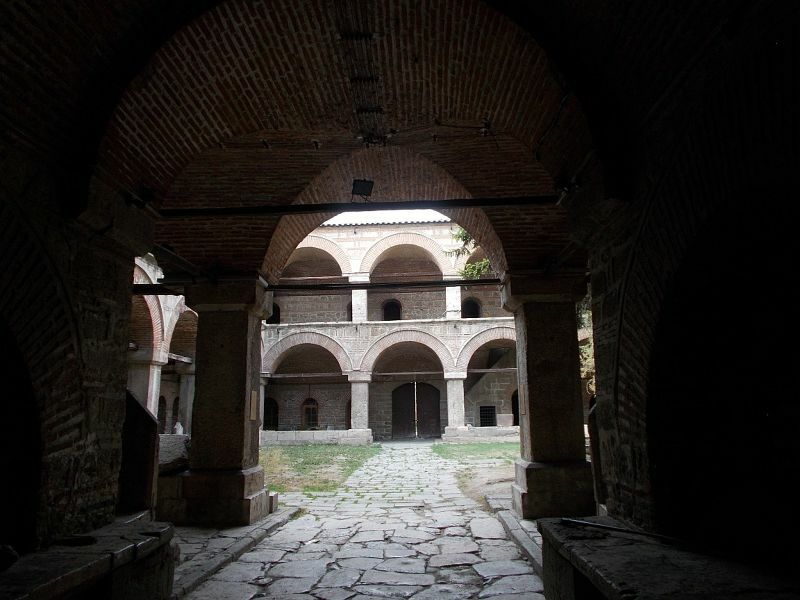 It is set inside a pleasant courtyard. There is an entry fee for going inside and photographs of the interior are not allowed. The church dates from the fourteenth century. 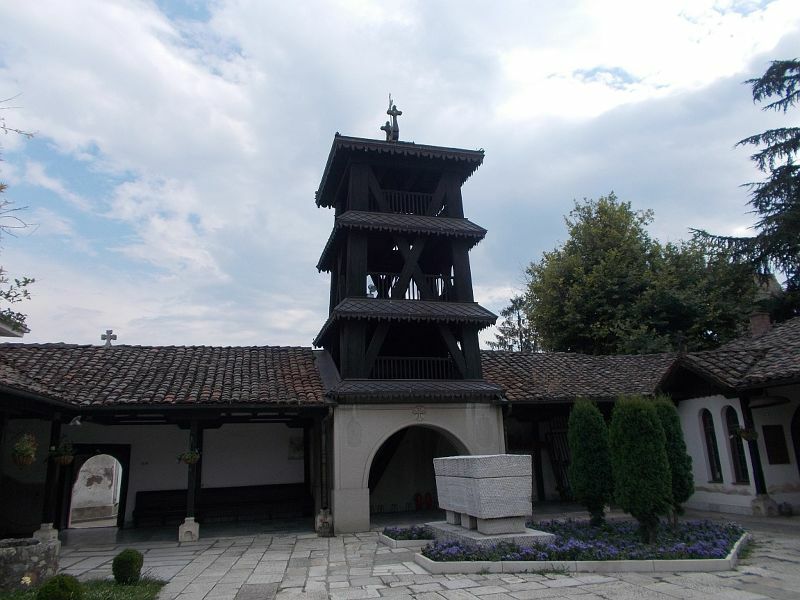 It has a beautiful and intricately carved wooden iconostatis. 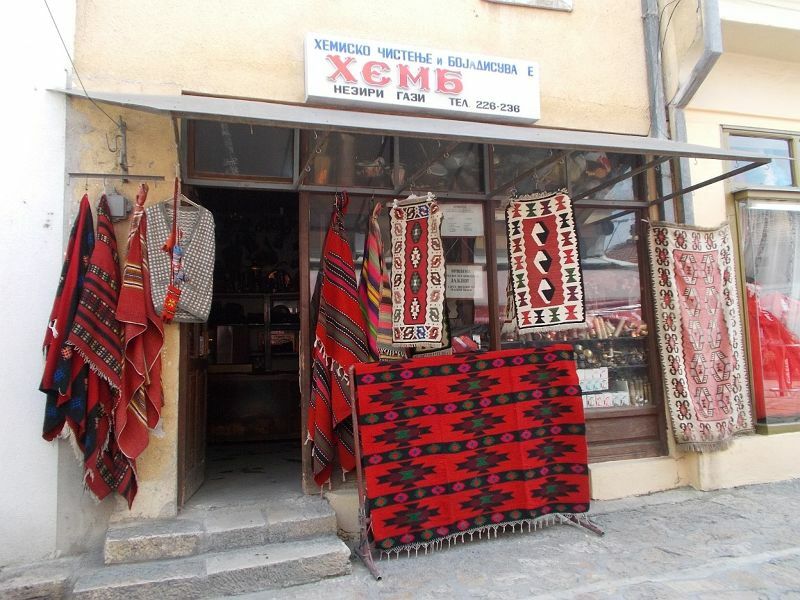 The guide pointed out interesting features such as some of the famous biblical figures being depicted in typical nineteenth century Macedonian clothing. 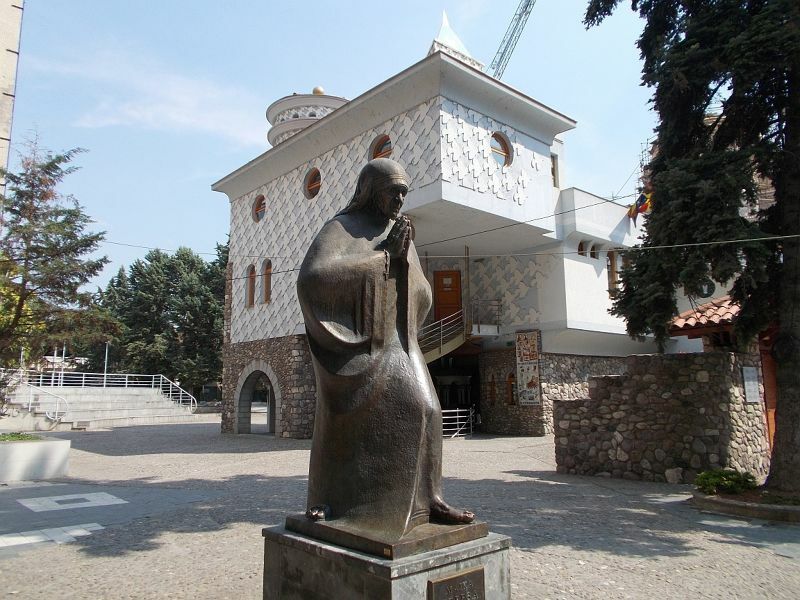 The iconostatis was carved by Makarije Frckovski and brothers Petar and Marko Filipovski. 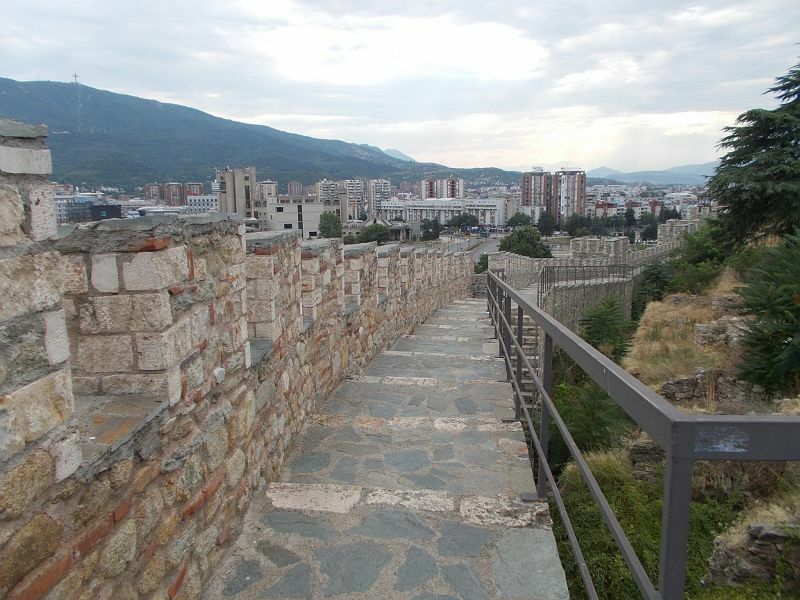 The Kale Fortress dominates Skopje's skyline. 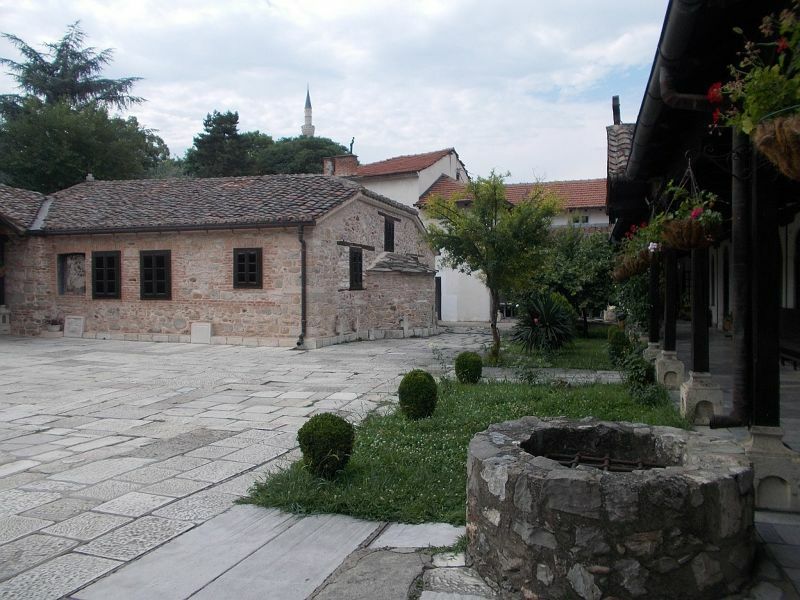 It is located close to the old Turkish part of Skopje. 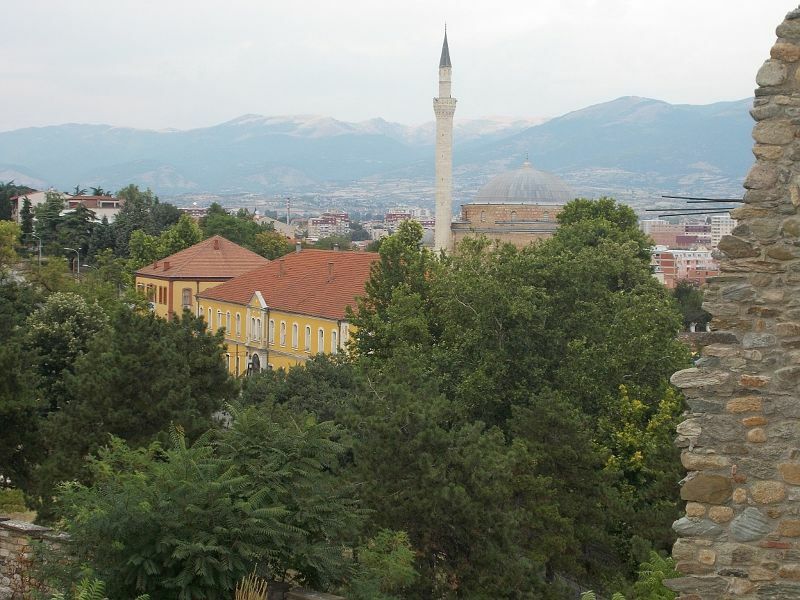 It was built in the sixth century by the Byzantines and was later controlled by the Ottomans. Some of the interior is currently being restored. I noticed quite an unusual sculpture inside. 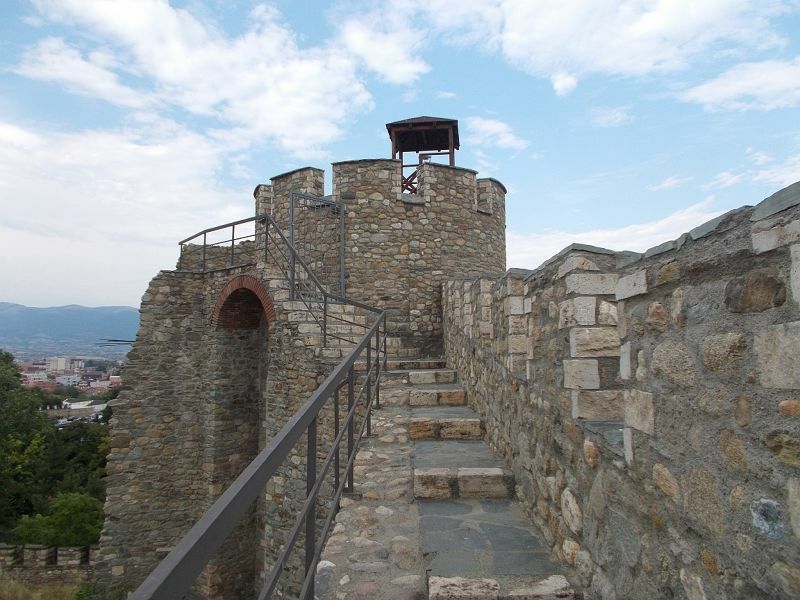 One of the best things about the Kale Fortress is that you can go onto its walls and get great views over Skopje. 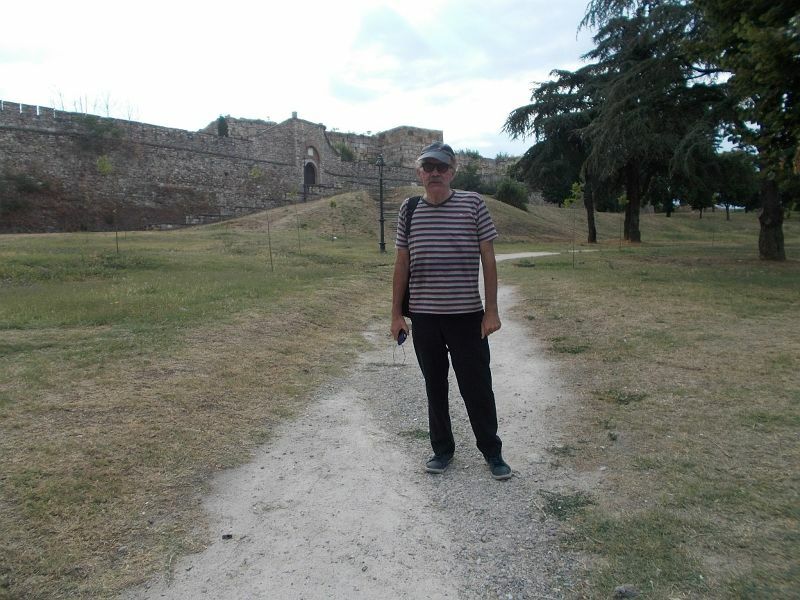 There were also lovely views from just outside the entrance to the fortress. At the moment to get out you have to retrace your steps around the walls otherwise you will end up trapped in a building site like me. I had to scale a wall to get out. The Stone Bridge: Kameni Most. 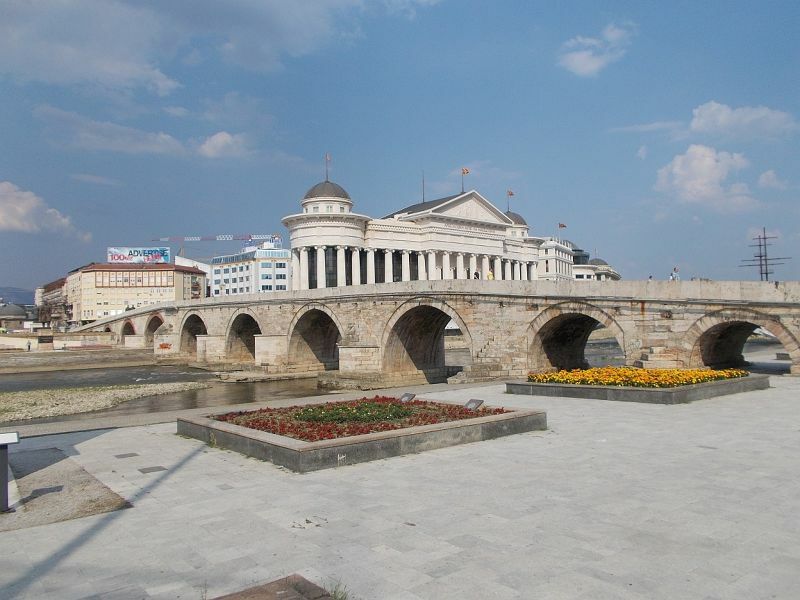 The Stone Bridge or Kameni Most crosses the Vardar River in the centre of Skopje. 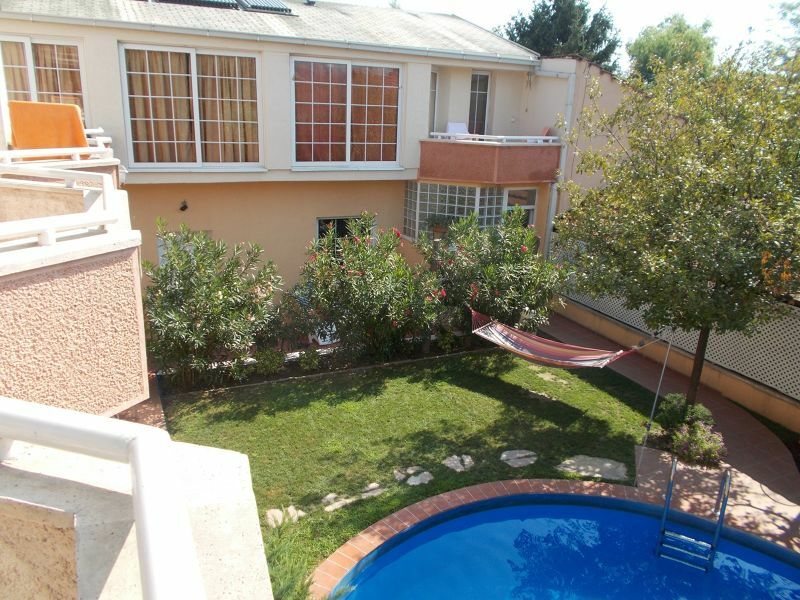 It leads you between the Turkish area and the more modern westernized area. 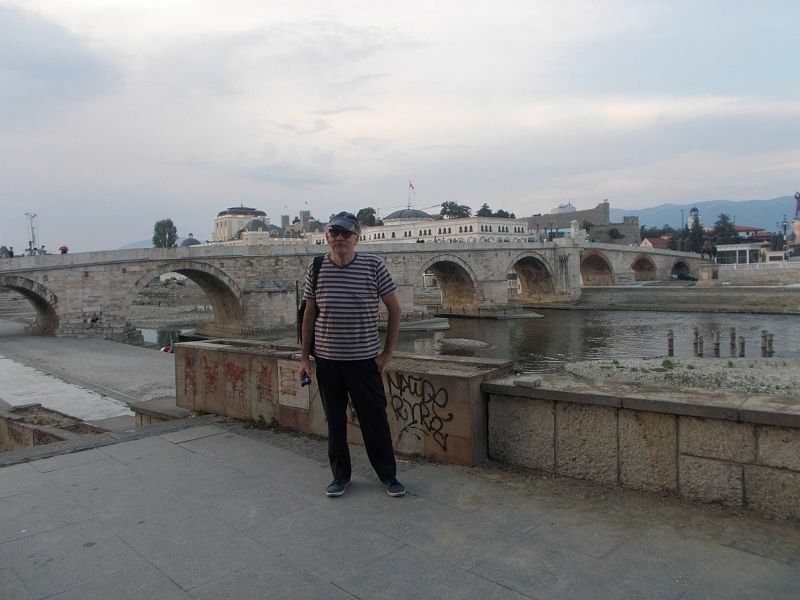 It is believed there has been a bridge at this spot since the sixth century AD, though the current bridge dates from the fifteenth century and was built under the orders of Mehmet the Conquerer. The bridge originally had stone pillar railings which were used by the Ottomans as places to spike the heads of their enemies. 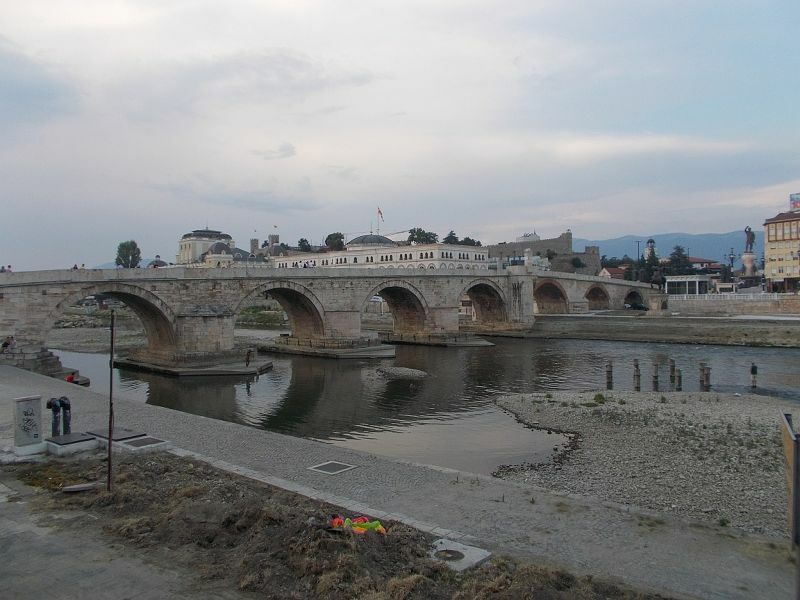 There is a memorial stone in the centre of the bridge for Karpos, nicknamed the King of Kumanovo, who led an unsuccessful uprising against the Turks in 1689. 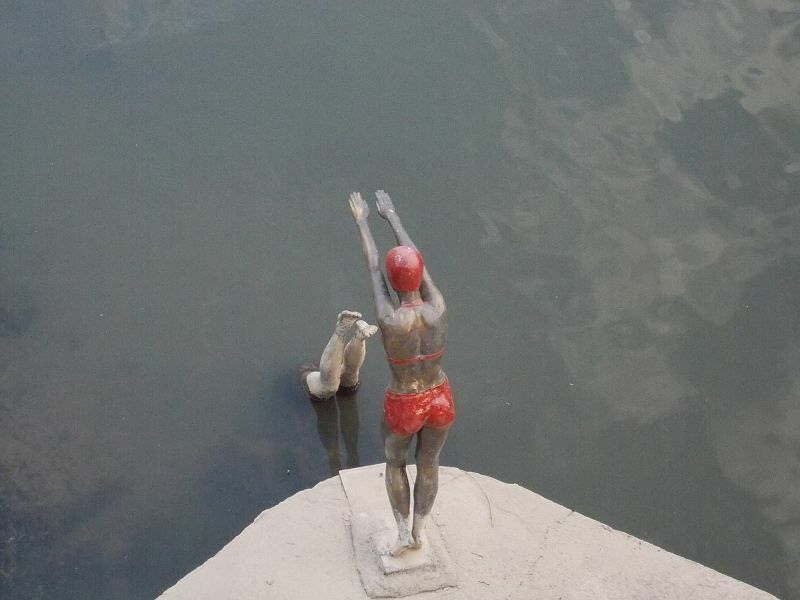 I liked the diving girls statue in the centre of the bridge. 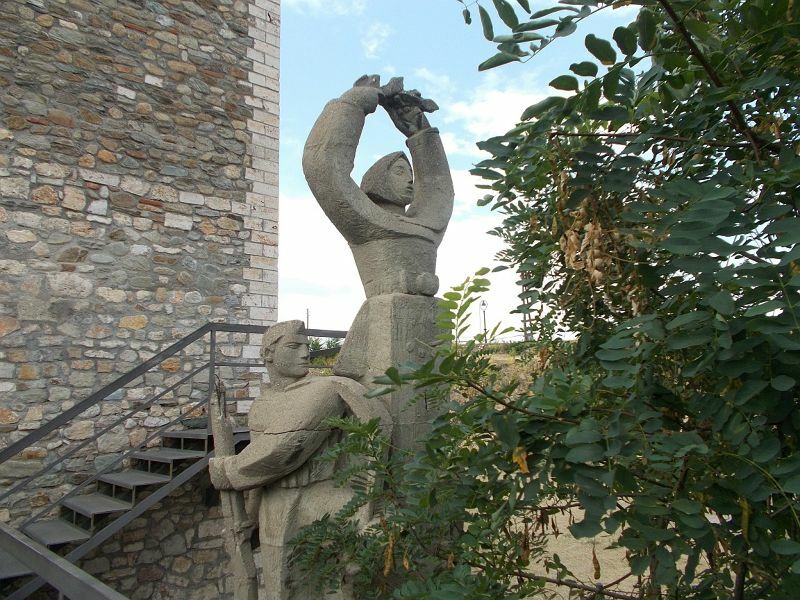 Kameni Most connects two statue filled squares. 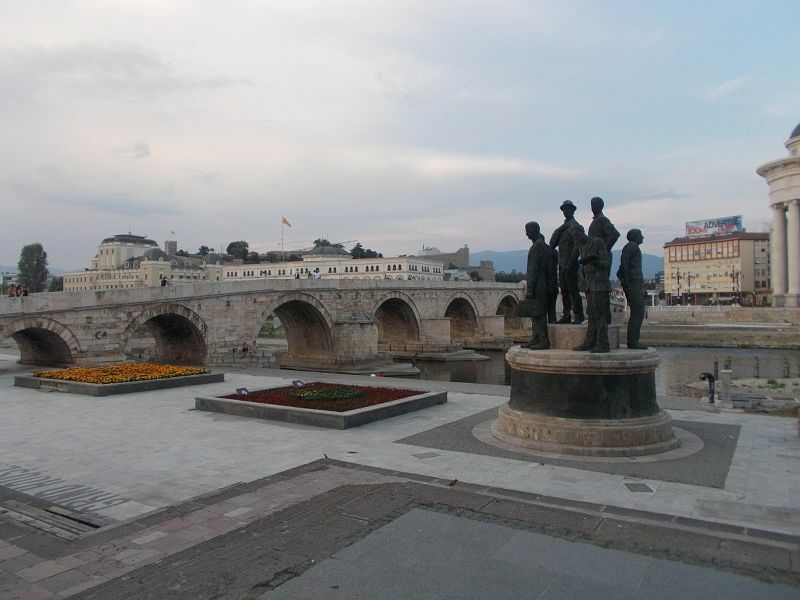 Macedonia Square or Makedonija Plostad is a large open square on one side of the stone bridge. 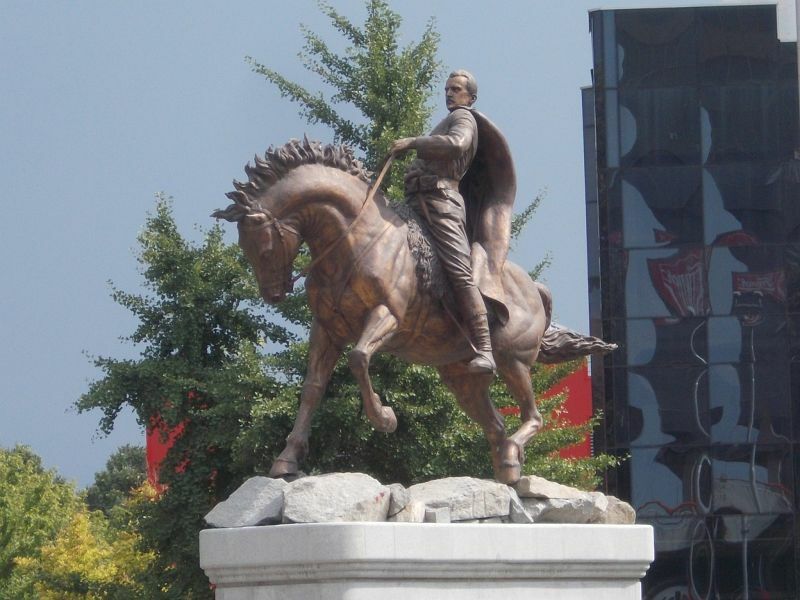 It is dominated by a huge statue of a warrior on a horse and has lots and lots of other statues, too. 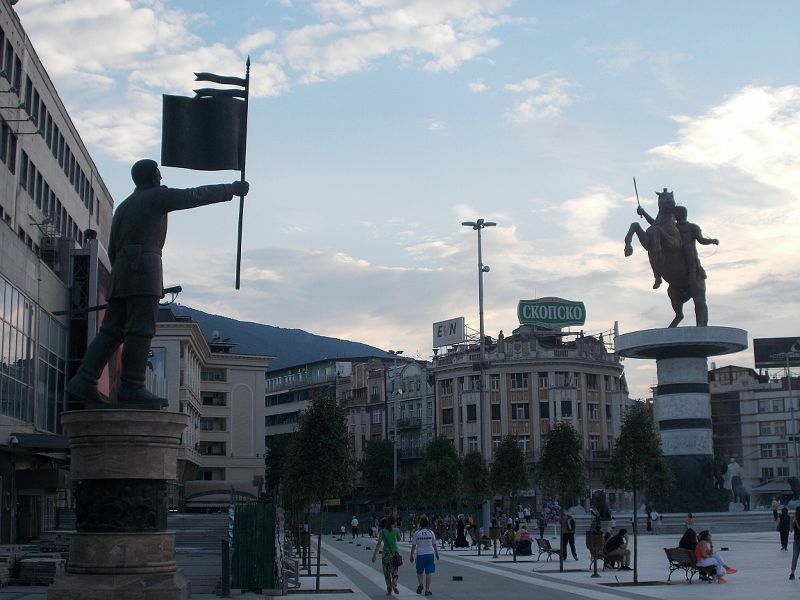 While I normally like statues, I must admit the quantity of them in Skopje was a bit overwhelming. Near this square there is a triumphal arch. 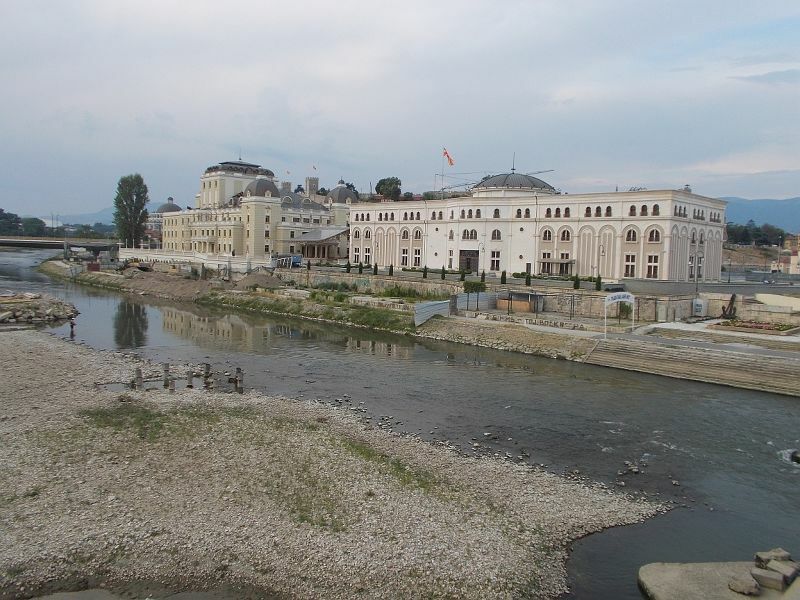 If you face the warrior on a horse statue and walk left along the river, the river is lined with restaurants and bars. Square Near The Triumphal Arch. 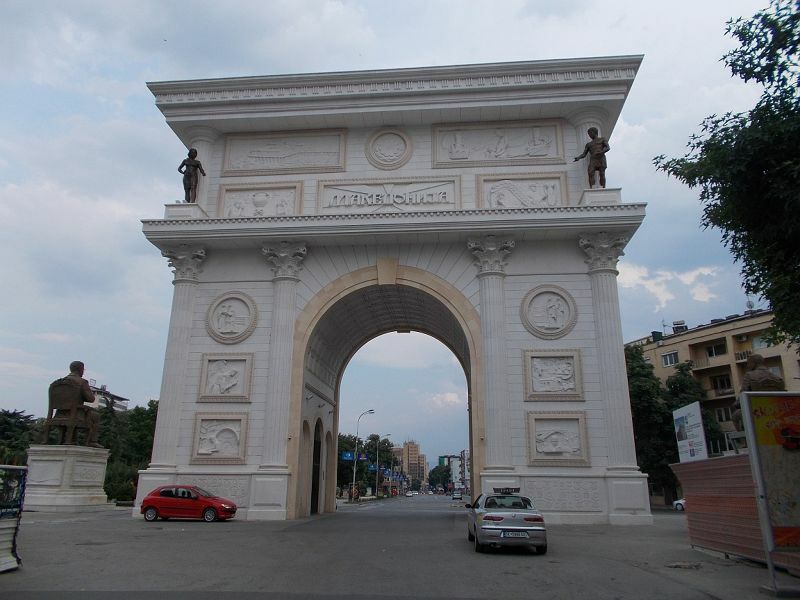 We walked through the triumphal arch and on the other side of it there was another statue filled square. 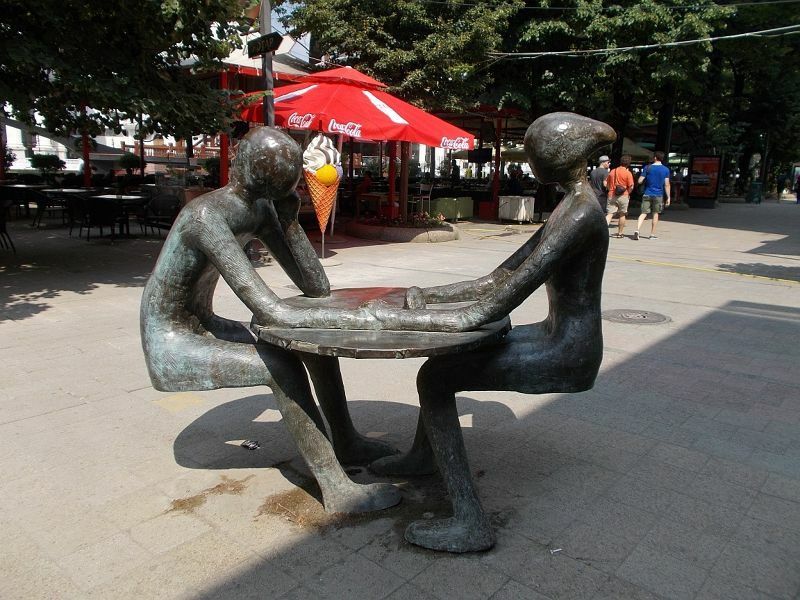 I do not know the name of this square, but I rather liked the statues in it. One of them was called the defenders; one was called Gemidzii. I don't know the names of the others. 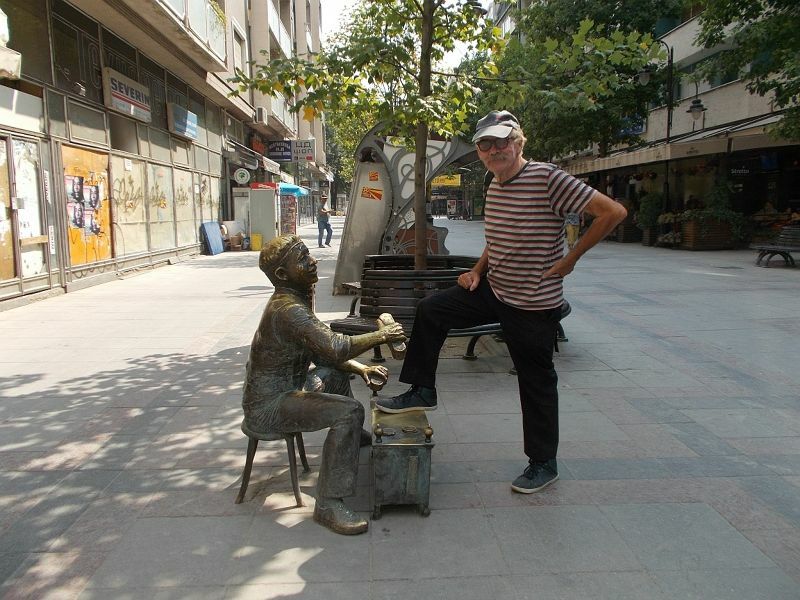 There were too many statues in Skopje to get to know them all. 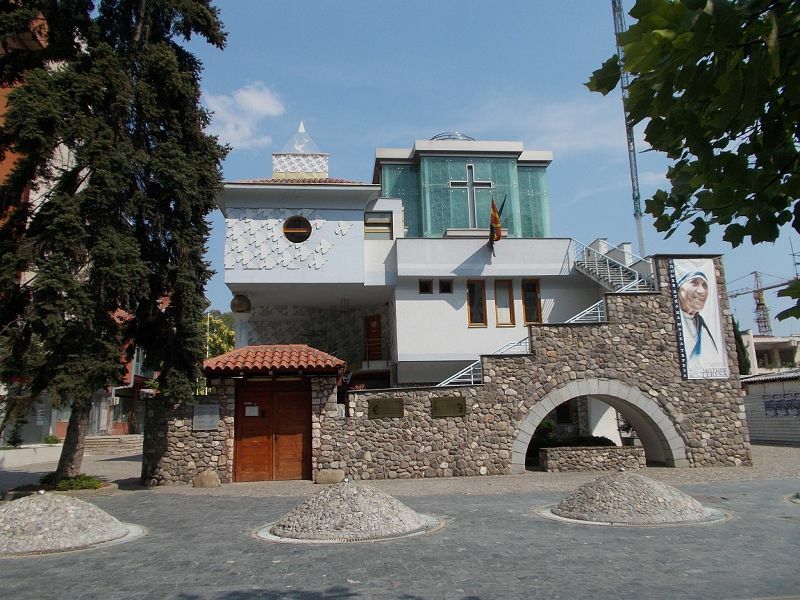 Mother Teresa was born in Skopje in 1910 and later devoted her life to caring for the poor in Calcutta. 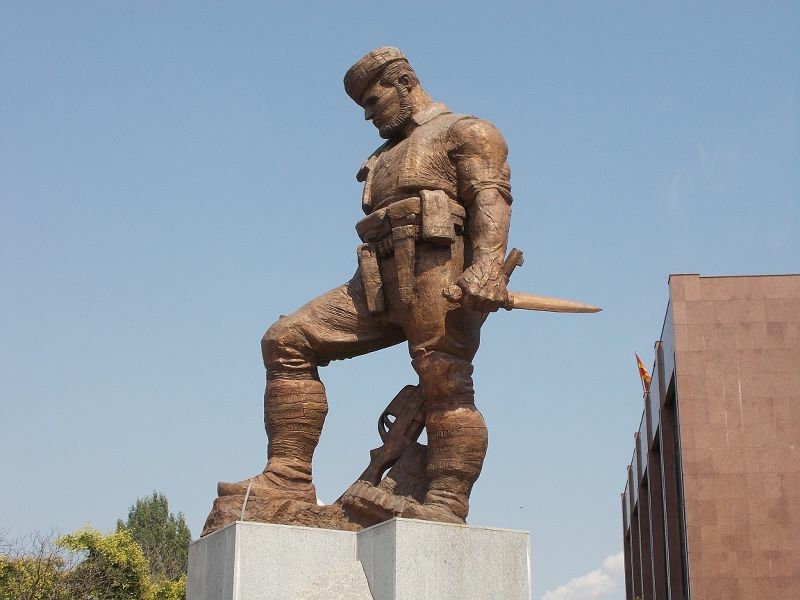 There is a statue of her not far from Macedonia Square. 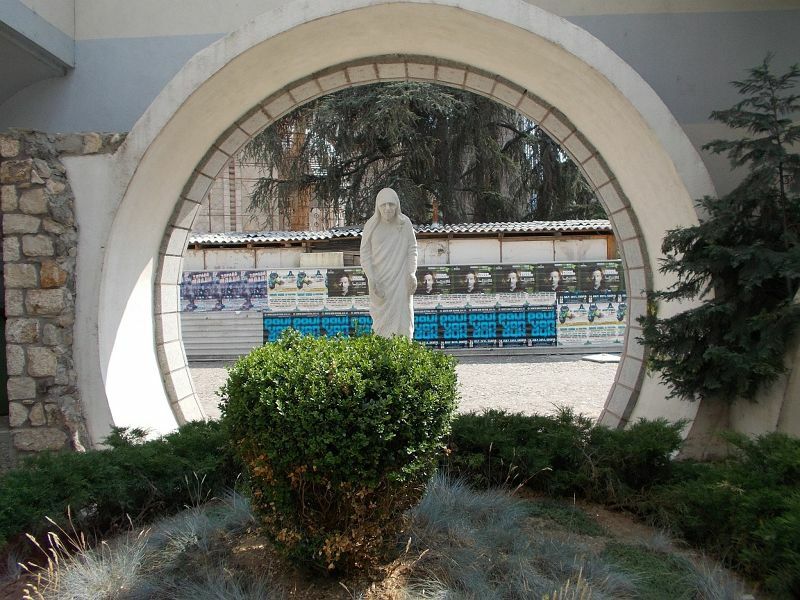 The statue is next to the Memorial House of Mother Teresa. This is an unusual looking building. It was not open when we visited. 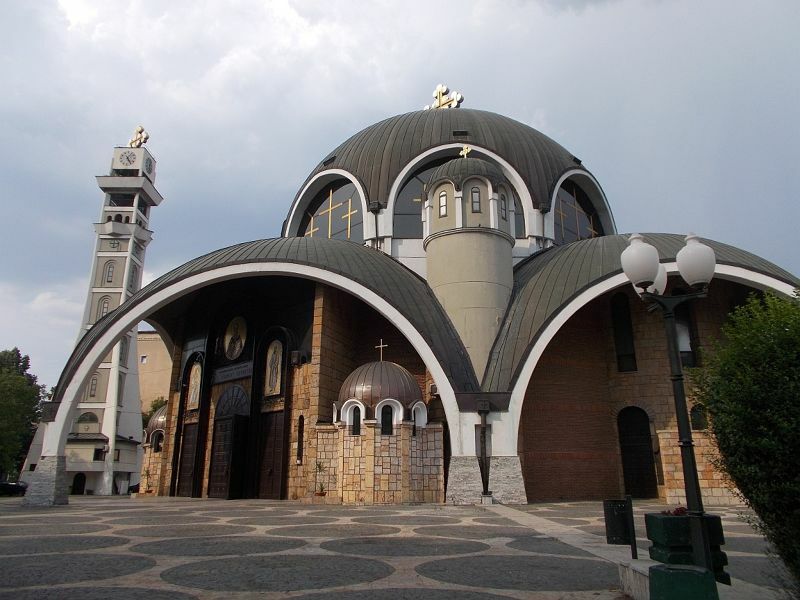 We decided to visit the Orthodox Cathedral which is an unusual modern looking building. 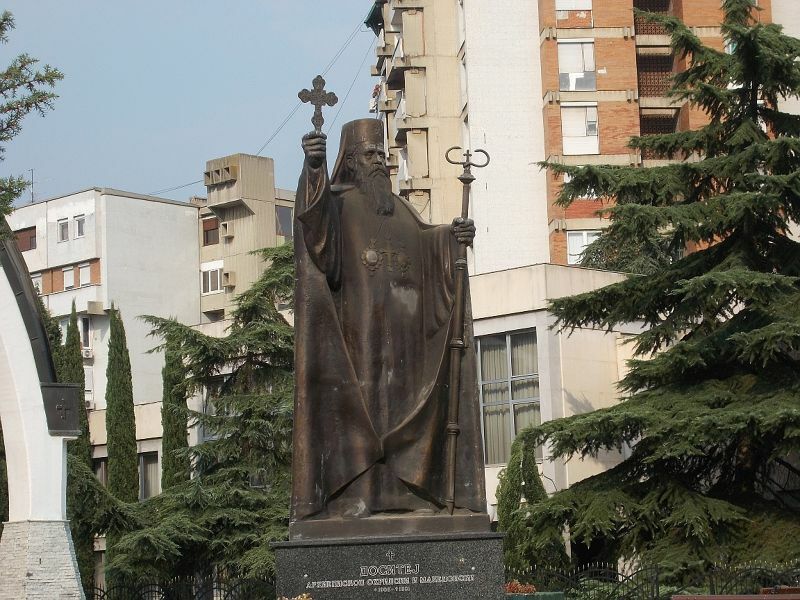 Outside it there is a fountain and a statue of an orthodox priest. 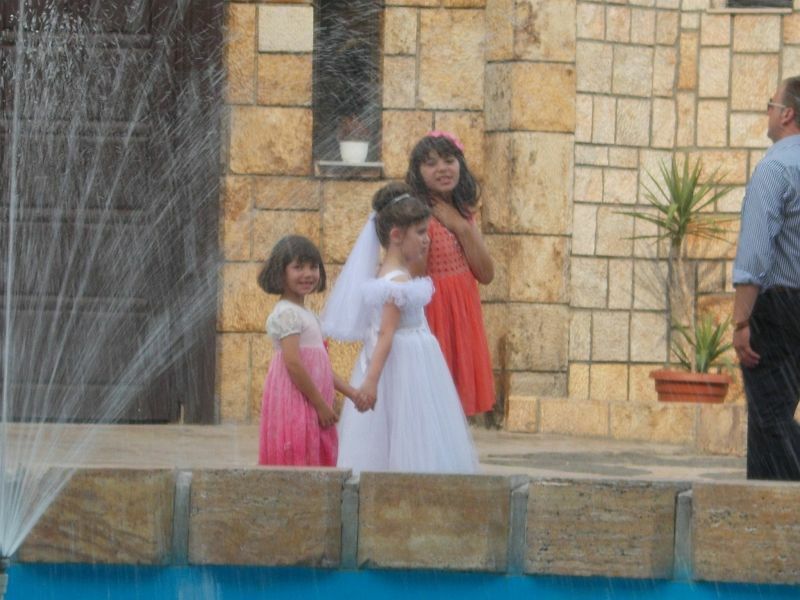 We had a quick look inside but there was a wedding about to start so we did not like to get in the way. Statues near Mother Teresa statue. 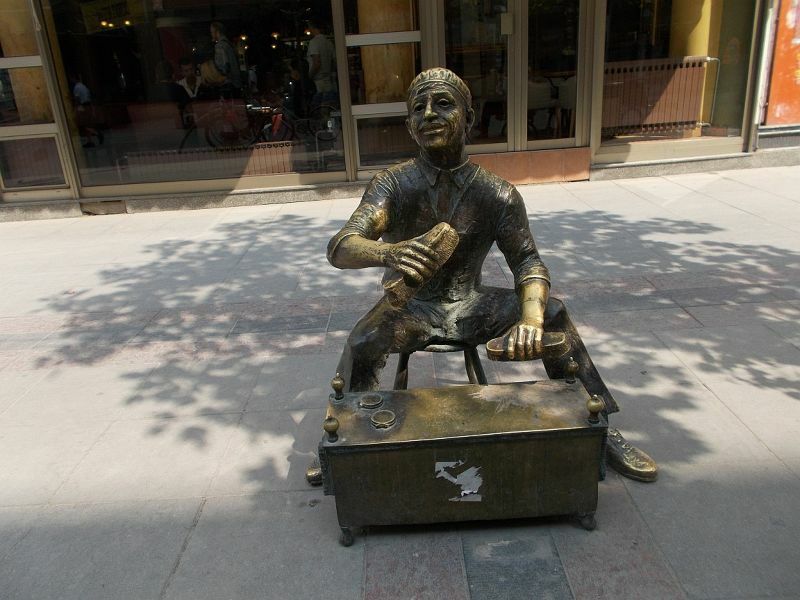 The street with the Mother Teresa statue and its memorial house had several small fun statues offering a welcome contrast to the enormous, serious-looking statues everywhere else. 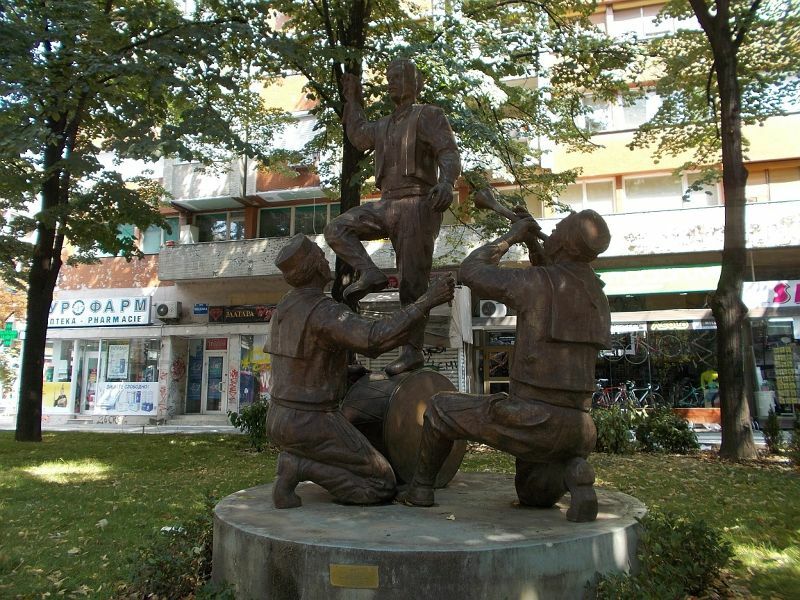 One of them displayed a homeless beggar and was called homeless, one was a little shoe shine boy and one was a group of Macedonian dancers celebrating. 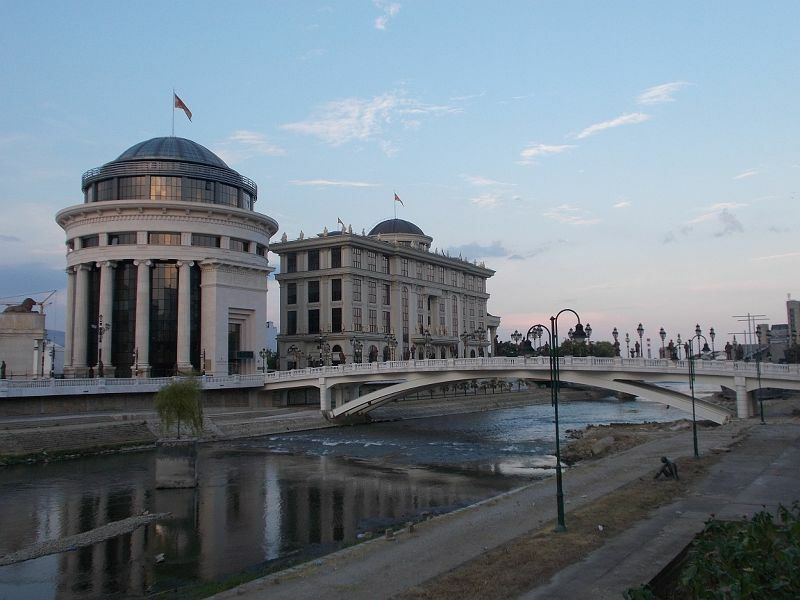 Skopje is divided down the middle by the Vardar River. 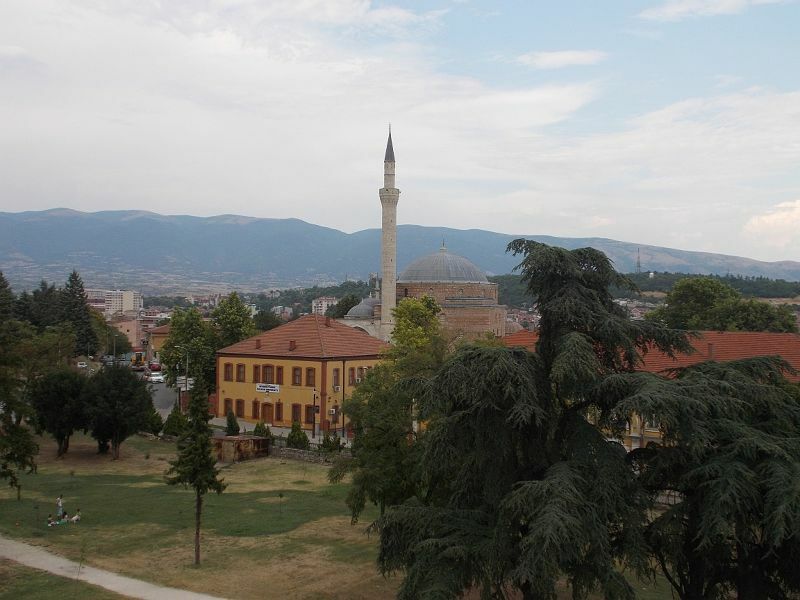 On one side is the old Turkish/Albanian Muslim side. On the other side is the more modern western side. There are walkways along the sides of this river. We enjoyed walking along it as darkness was falling. It was a good place to watch the lovely sunsets . Suna Bar: Pleasant spot for a drink. 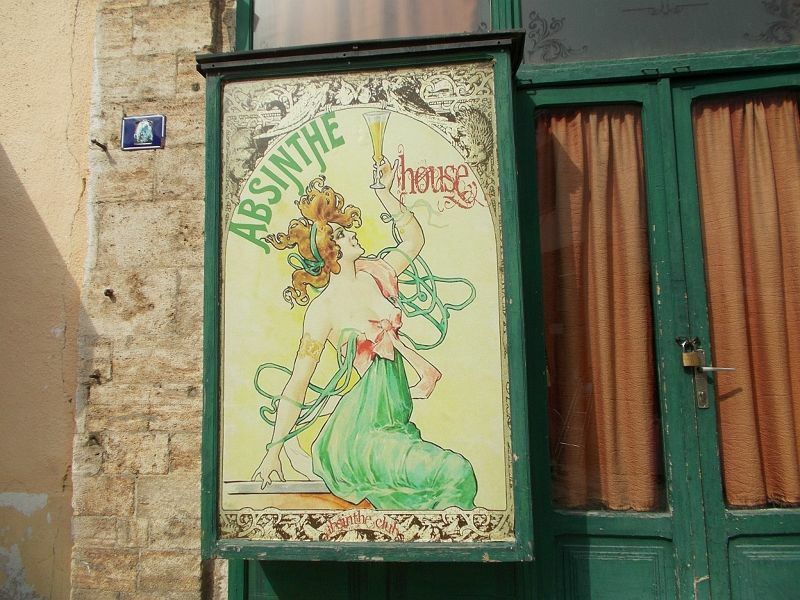 Directly across from the Memorial House of Mother Teresa there is a pleasant little bar. 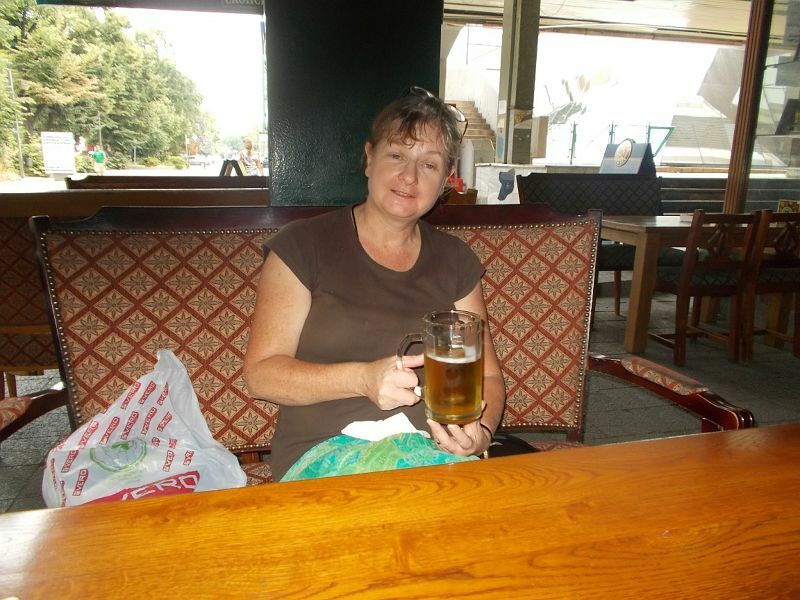 We sat outside in the shade and enjoyed a lovely cold beer and an iced coffee here. Service was friendly and pleasant. Old Town Brewery: Lovely, Friendly Pub. 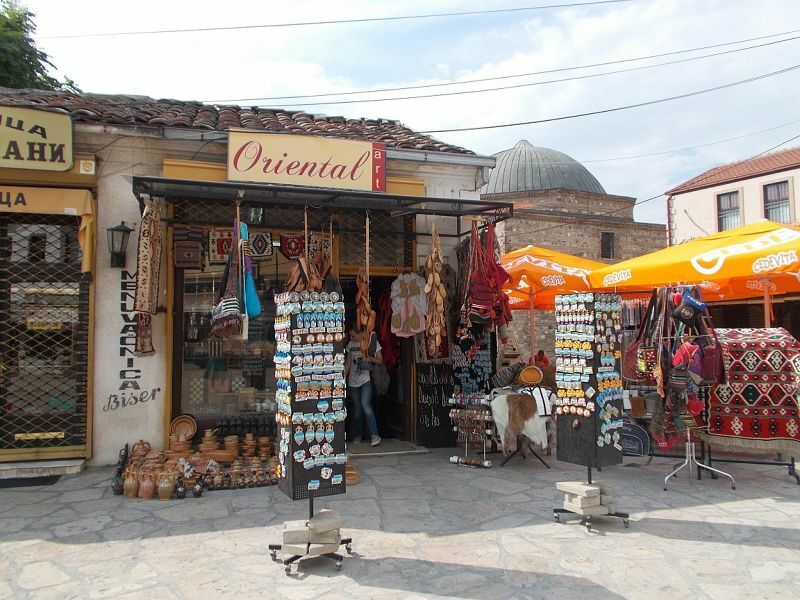 This is a very pleasant bar situated in the Turkish part of Skopje. 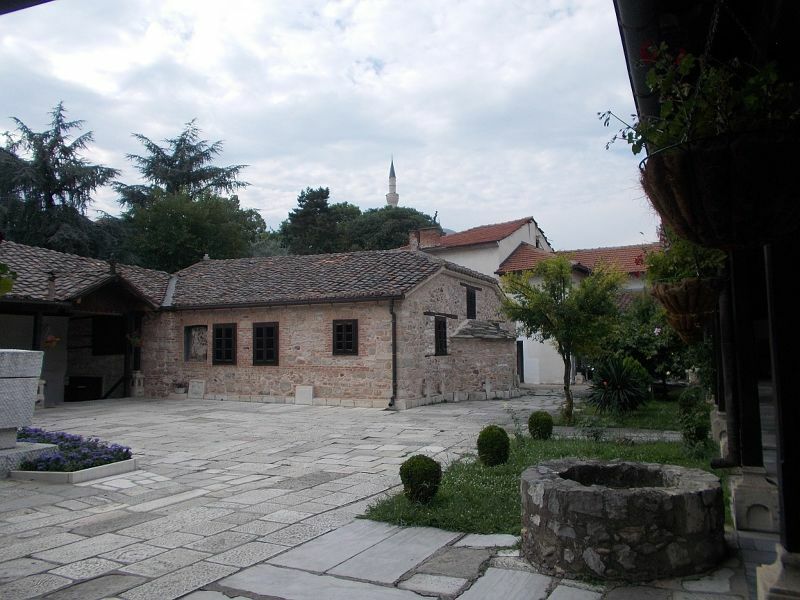 It is close to Sveti Spas Church and the Kale Fortress. 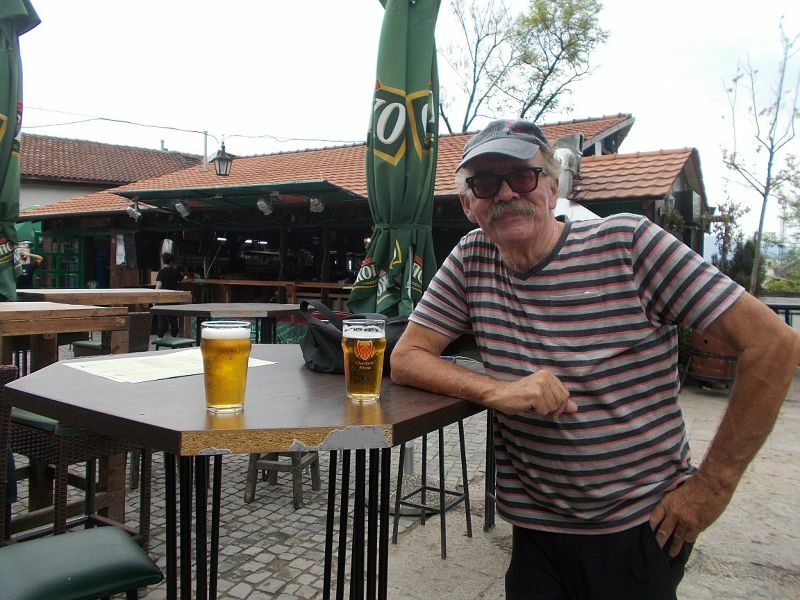 We sat here and enjoyed some ice-cold Skopsko beer. Service was friendly and efficient. 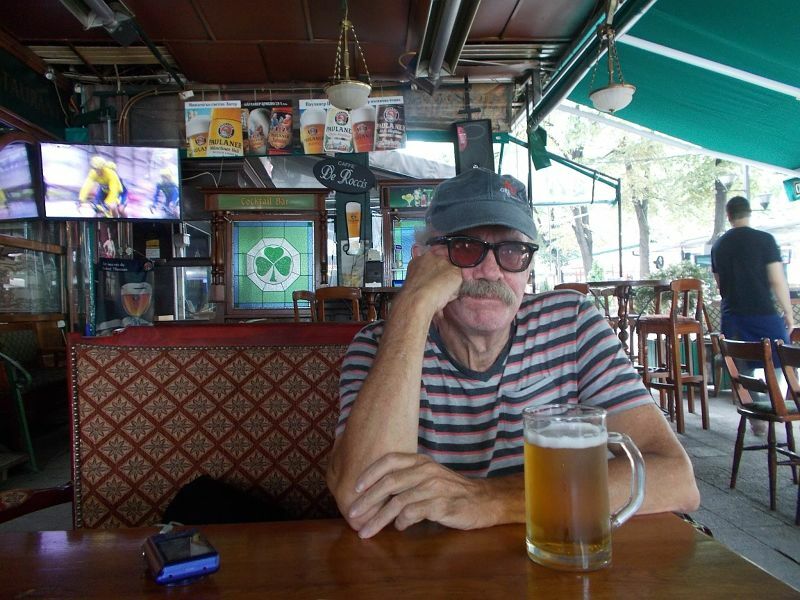 Saint Patrick's Irish Pub: Friendly Pub. 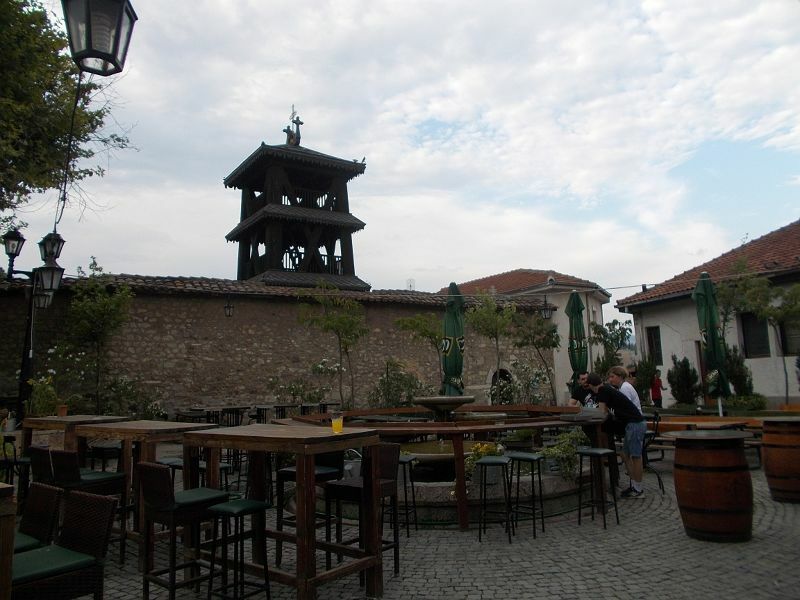 This pub is situated on the Vardar River not far from the Holiday Inn. There are lots of restaurants and bars in this area. 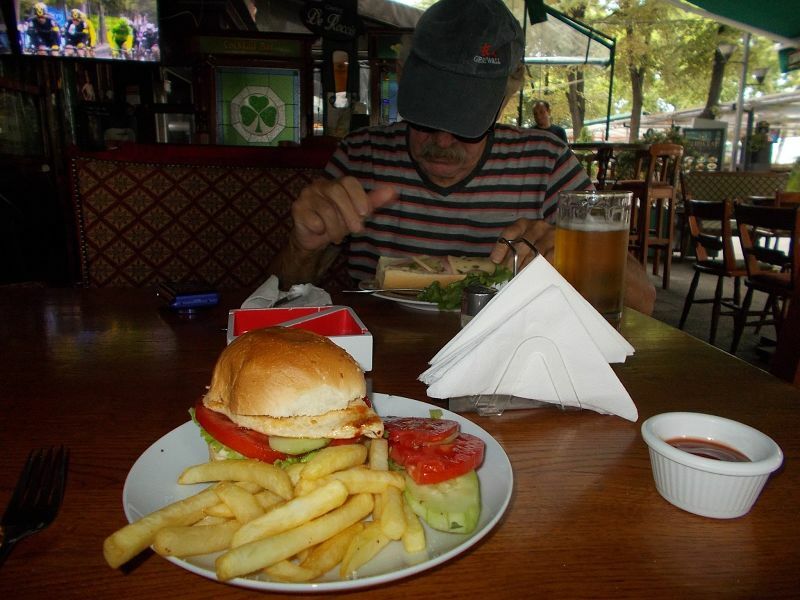 We had a light meal here as Peter was having stomach problems and had not eaten for a couple of days. Service was very friendly and efficient. The pub is in a pleasant spot. 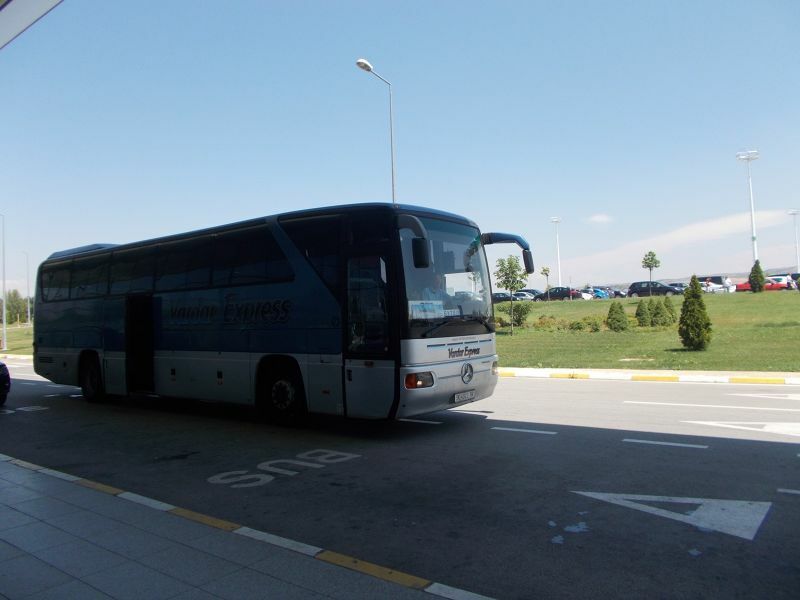 Bus to Skopje from Nis. 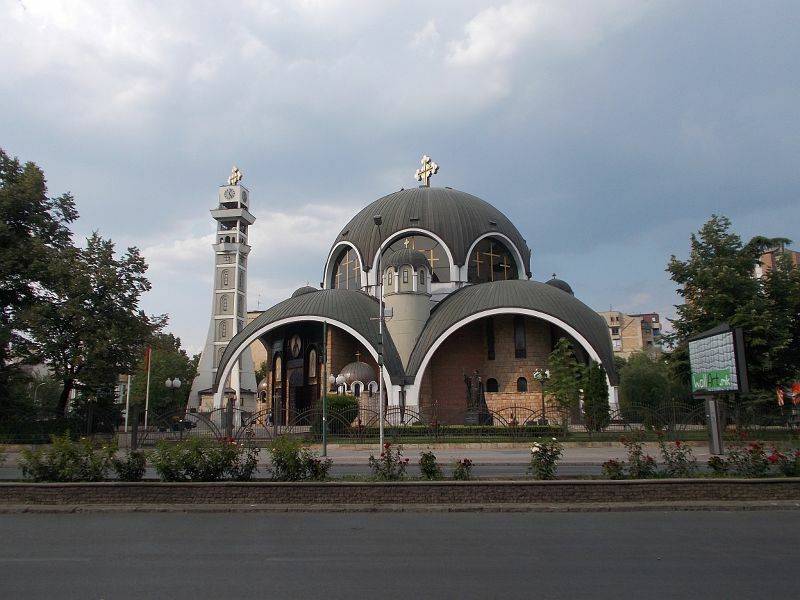 We travelled to Skopje by bus from Nis. The journey should have taken around four hours, but it actually took more than five. It was a bit cramped and some people who boarded on route had to stand. There was no toilet on the bus nor were there any comfort stops, so not a very pleasant journey. I have a massive preference for visiting places that have public transport to and from their airport as airport taxi drivers are renowned for ripping people off. 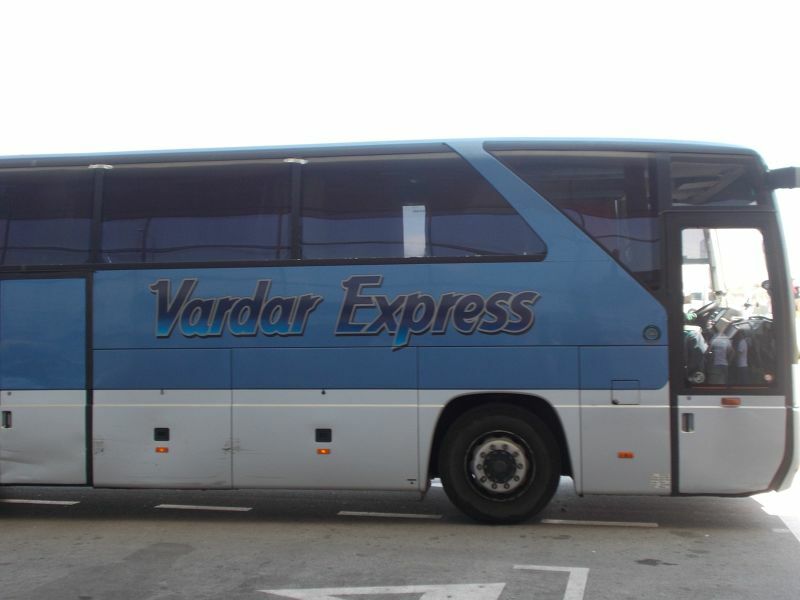 We were able to buy tickets for Vardar Express airport buses from Skopje's bus station. 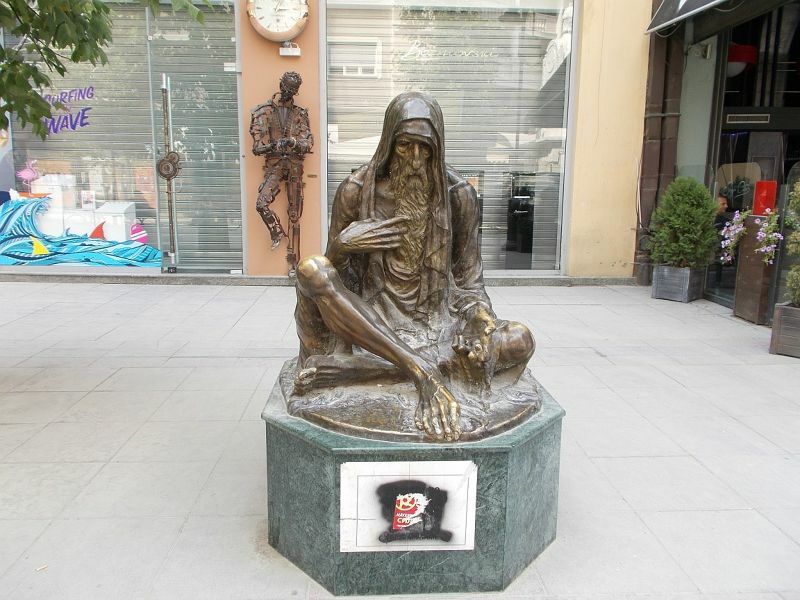 The bus leaves from outside the Zegin Pharmacy near the bus station. 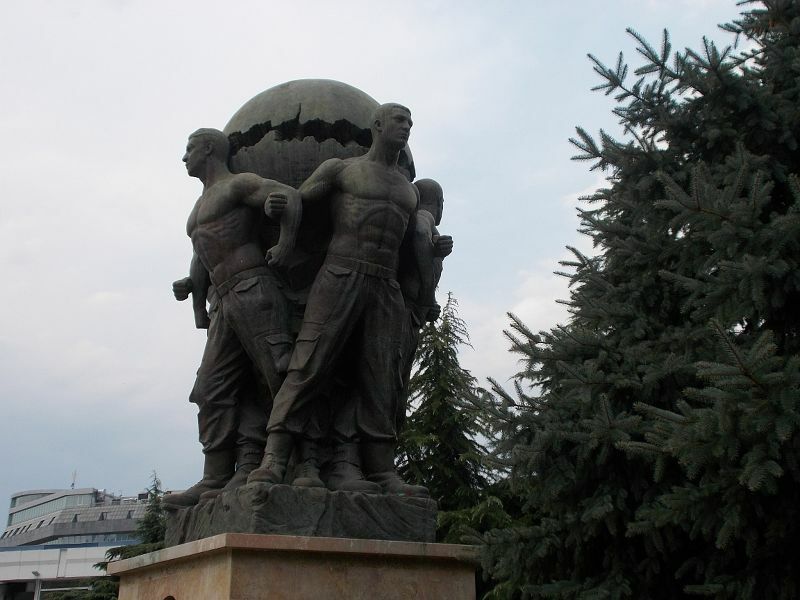 It also picks up from other places such as outside Skopje's Holiday Inn. 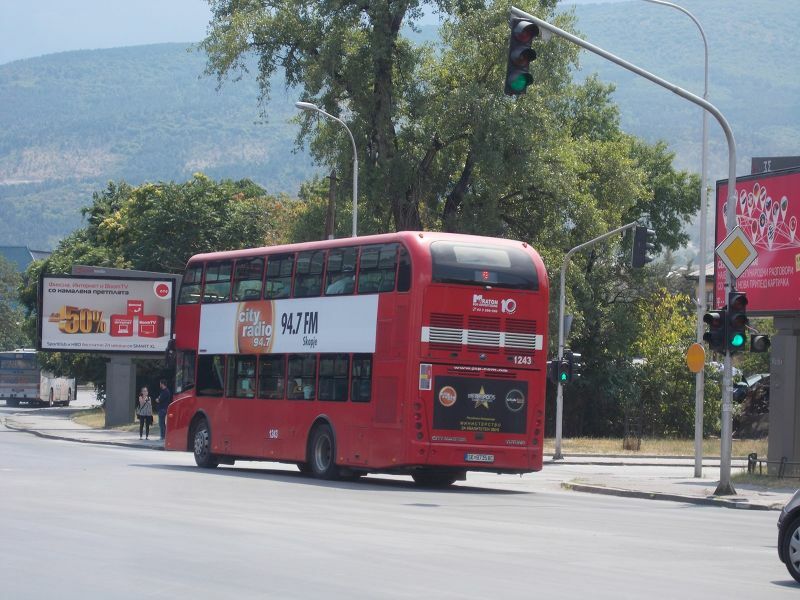 Skopje had a whole fleet of new looking, bright red London double decker style buses. We did not use them unfortunately, but they looked really neat. I noticed one even seemed to go to the Millenium Hill where the huge cross is. 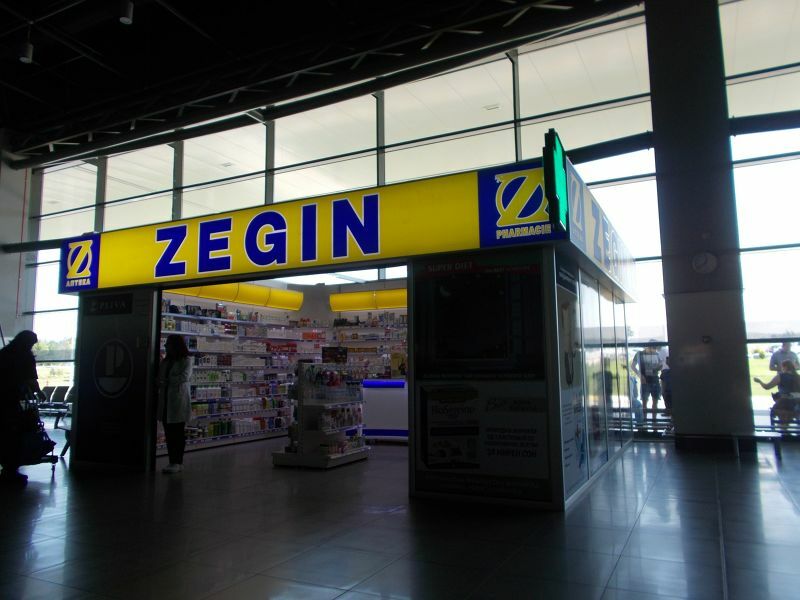 Zegin Pharmacy: Very Useful When You Are Feeling Ill.
We went to the Zegin Pharmacy at the bus station to get medicine for my husband who was suffering from food poisoning at the time. We are guessing this came from an ice lolly he had in Nis which was almost solid ice in the centre implying it had melted and been re-frozen. The girl at the pharmacy spoke good English and was very helpful. If you are using the airport bus, the stop is right outside this shop. We also used the Zegin Pharmacy at the airport. Vero Supermarket: Perfect for all your needs. This shop was handy for our hotel and we were in it a lot, not least because it had clean, free toilets and my husband had food poisoning during our visit. Vero was within a shopping centre that had ATMs, a bank, a money exchange and other things. Vero itself was perfect for cold drinks, food and toiletries.